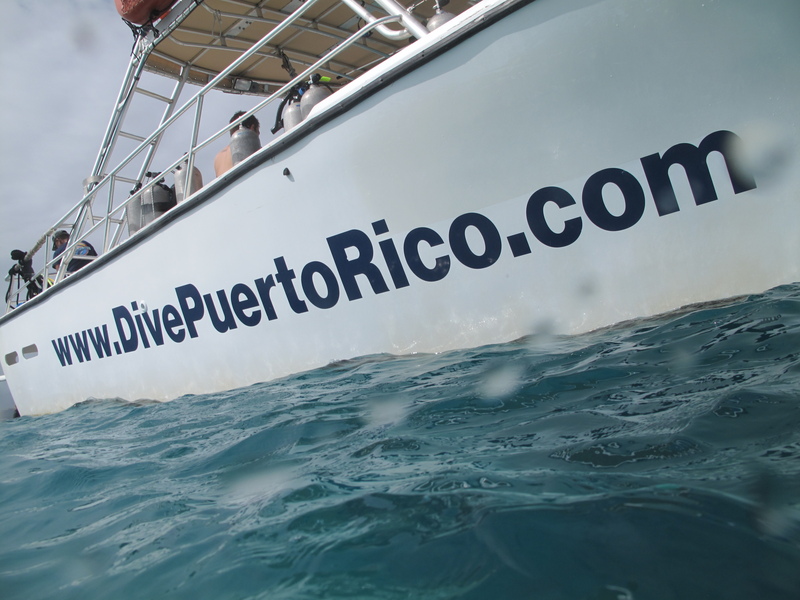 For Thursday, we ventured to the other side of the island to experience some different dive spots and a whole new perspective of Puerto Rico. 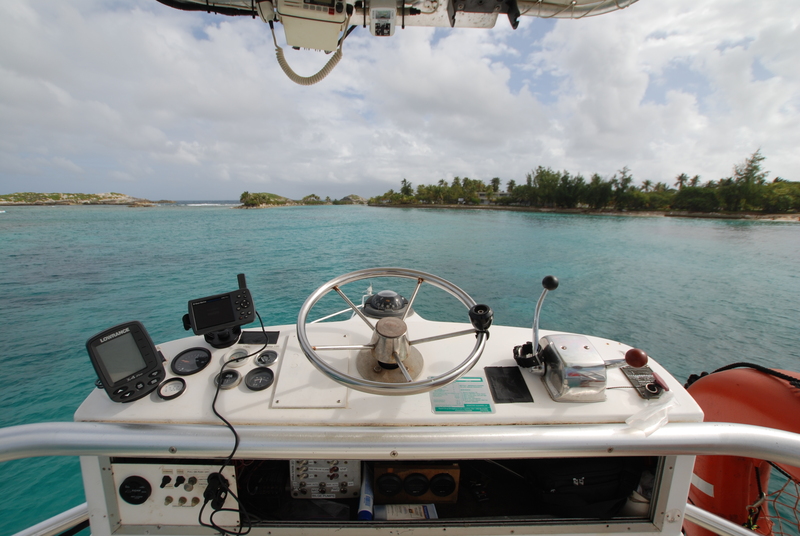 The Sea Ventures crew had driven the boat to the different marina and had the gear ready to go. 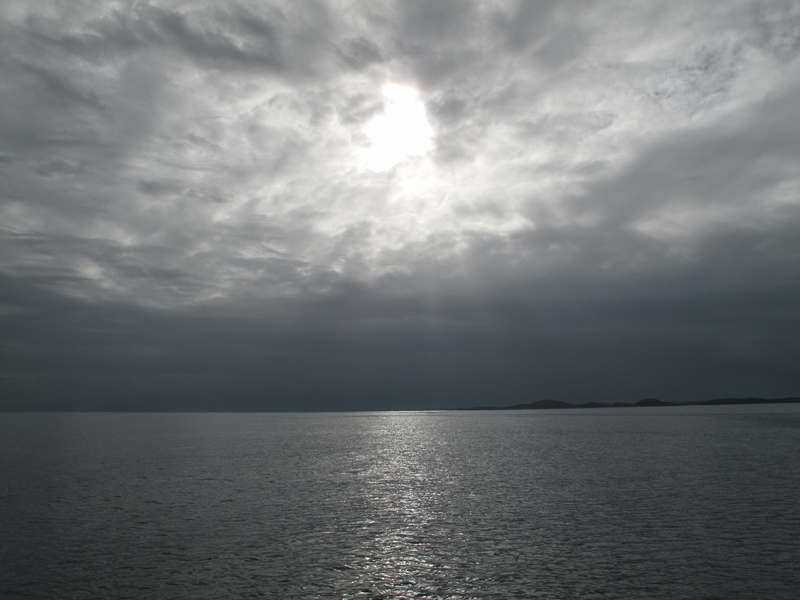 While the crew boarded the boat, the grey skies above released some refreshingly cool rain, a big change from the weather we had been experiencing. 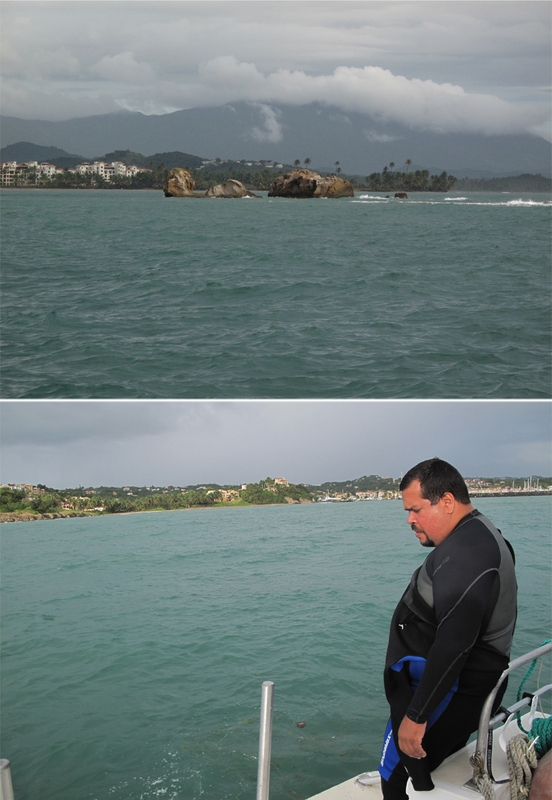 The students reached for their long-sleeve shirts and sweaters, ready to go out into the Atlantic for some more amazing SCUBA. 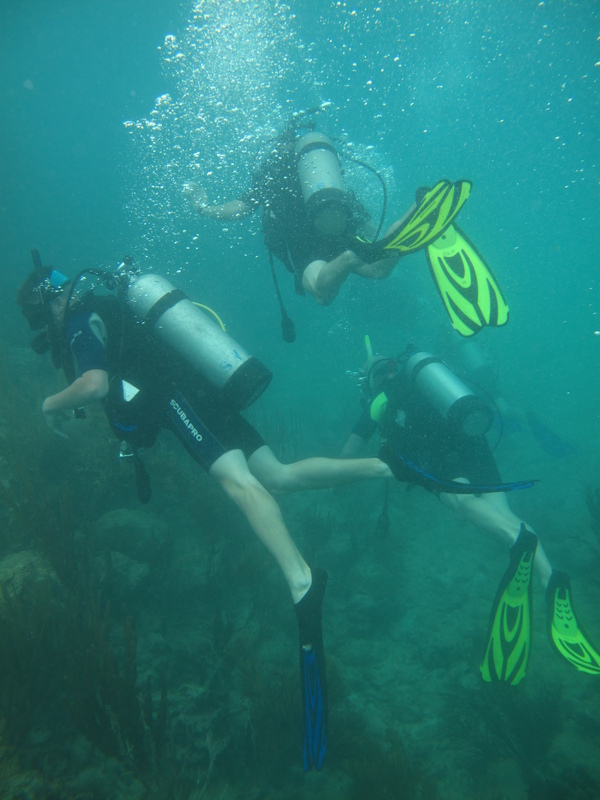 Since they had completed all the necessary skills for their certifications, these two dives were considered “fun dives.” Students enjoyed some new scenery as well as some more lionfish hunting. 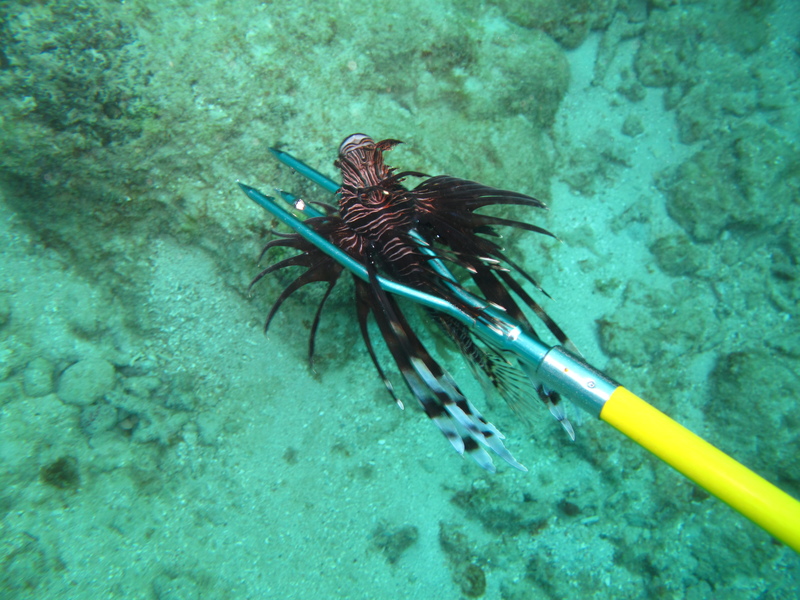 Today, not only did the students get to catch many lionfish, but a spiny lobster was also brought aboard. This was an excellent treat and was later cooked up by Mama Shipley and served poolside by candlelight. 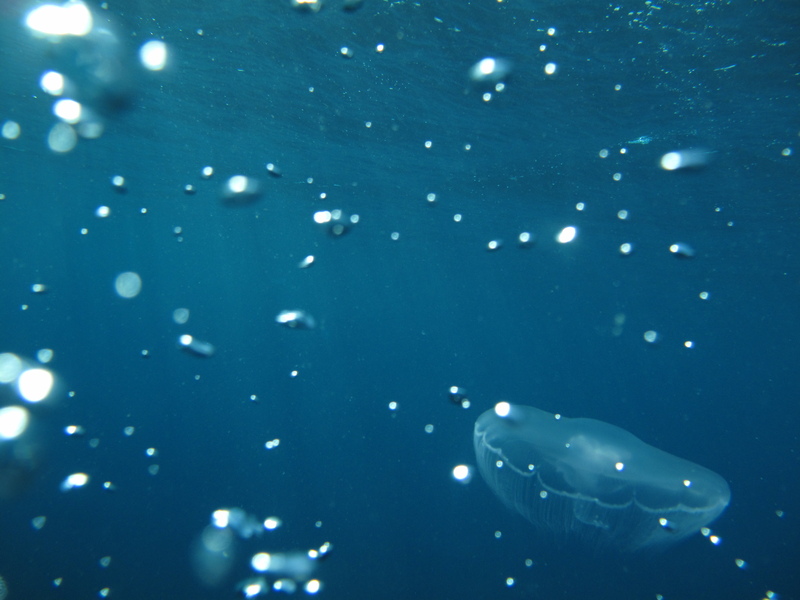 Several students also got to swim through a school of beautiful moon jellyfish. While they are almost hypnotic to look at, they do pack a punch with their stinging tentacles. Nothing a little urine can’t help with though, and the boys were more than happy to offer their assistance to anyone stung. 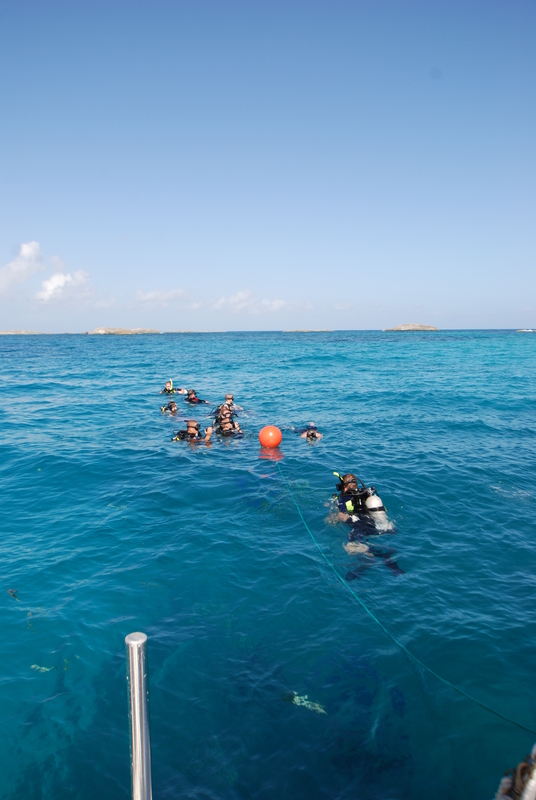 The waters on this side of the island were much more blue than the other side and the students enjoyed having a free-dive where they weren’t concerned with practicing any skills and could simply enjoy the dive. 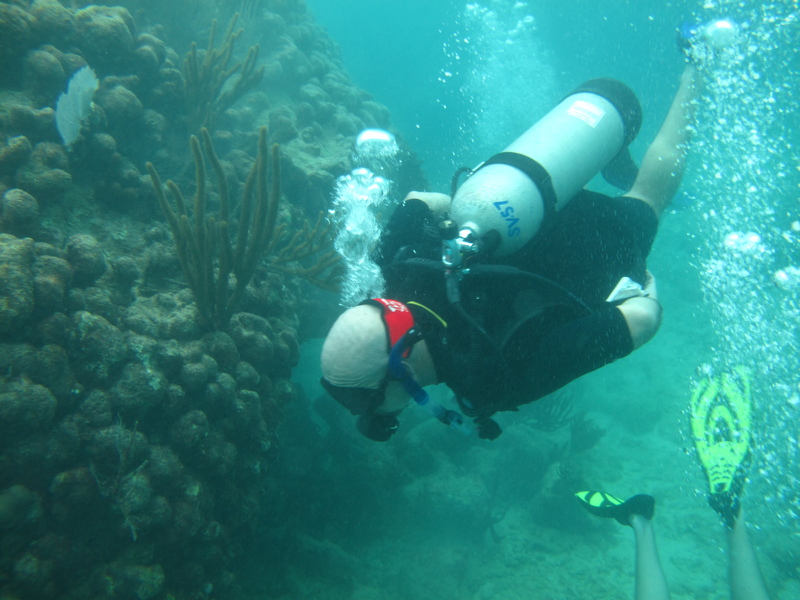 These were the last two dives of the trip, so even our cameraman pushed himself to the extremes to film every minute he could. 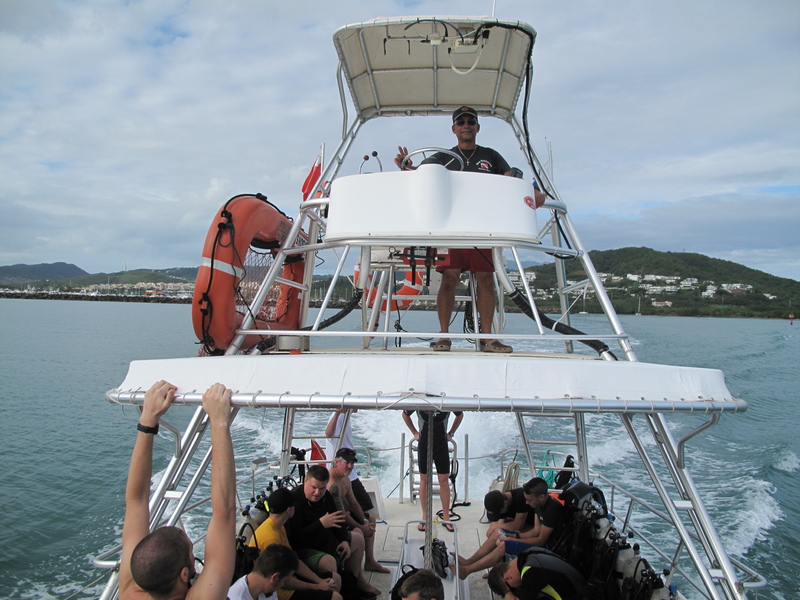 A huge thanks to the crew from Sea Ventures for facilitating quite possibly the best week of diving possible in Puerto Rico! 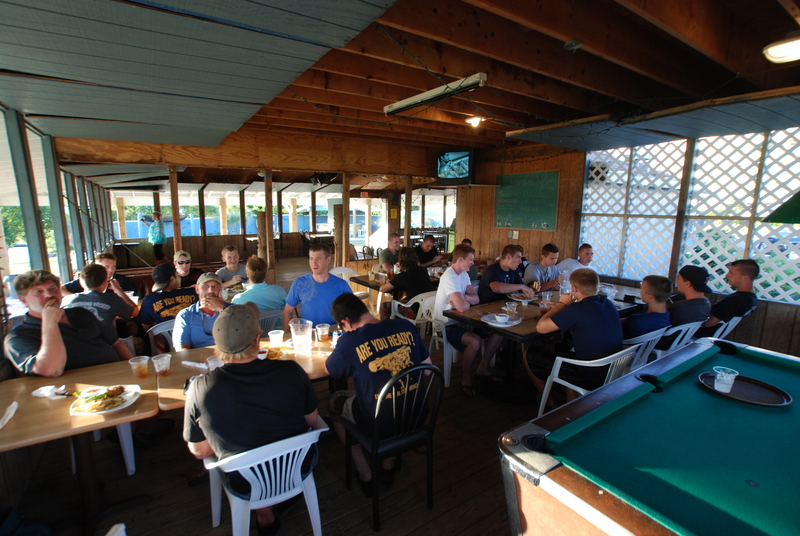 The boys got a nice afternoon to relax and reflect before their intense PT in the morning. No week of SEAL camp in complete without a monster mash! Plus, after the intense PT, they have a very relaxing reward in store, stay tuned! 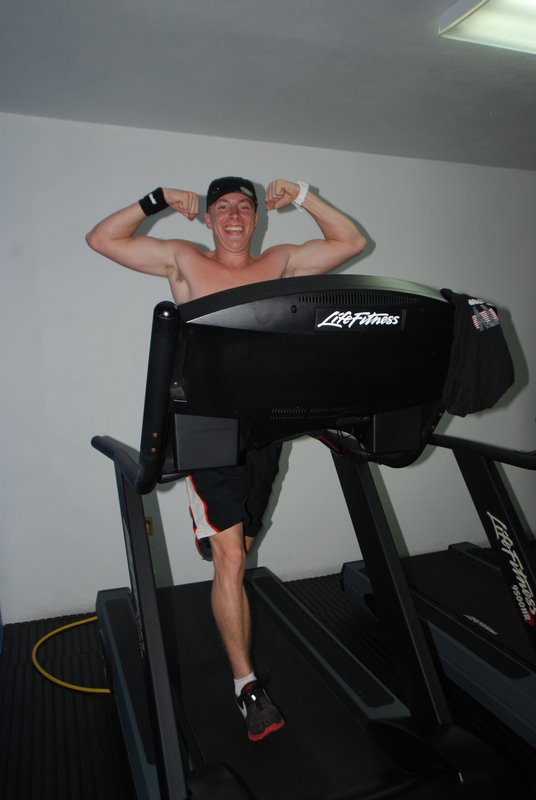 Wednesday morning started like all of the others with an intense PT led by Chief Fuch in the hotel resort’s gym. 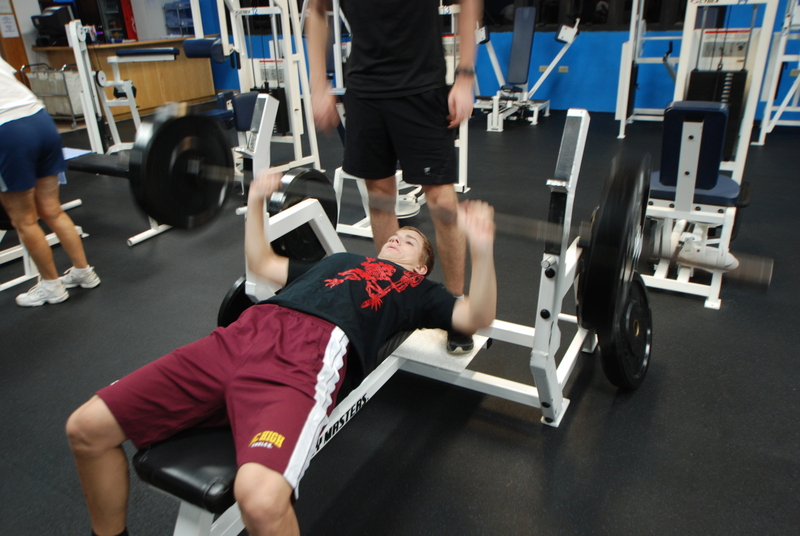 The boys trained in calisthenics, free weights, and cardiovascular. Breakfast was served poolside before the short drive down the highway to the marina. 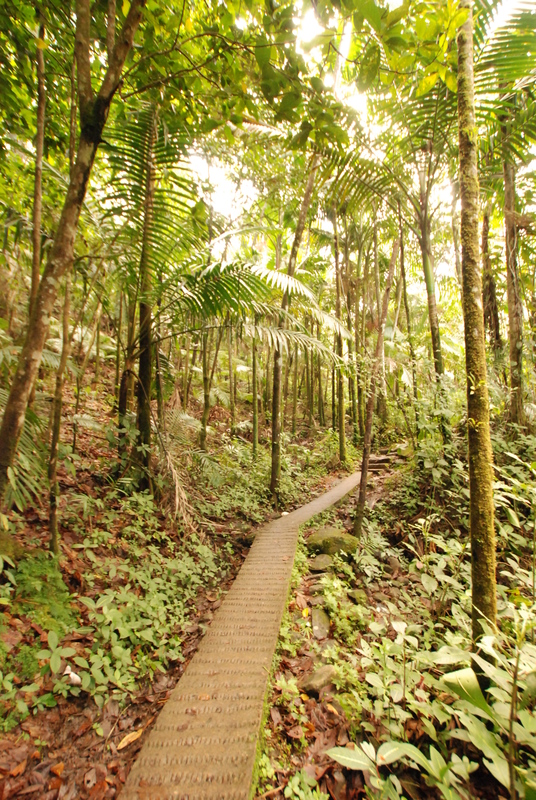 Every drive in Puerto Rico is an adventure in itself! 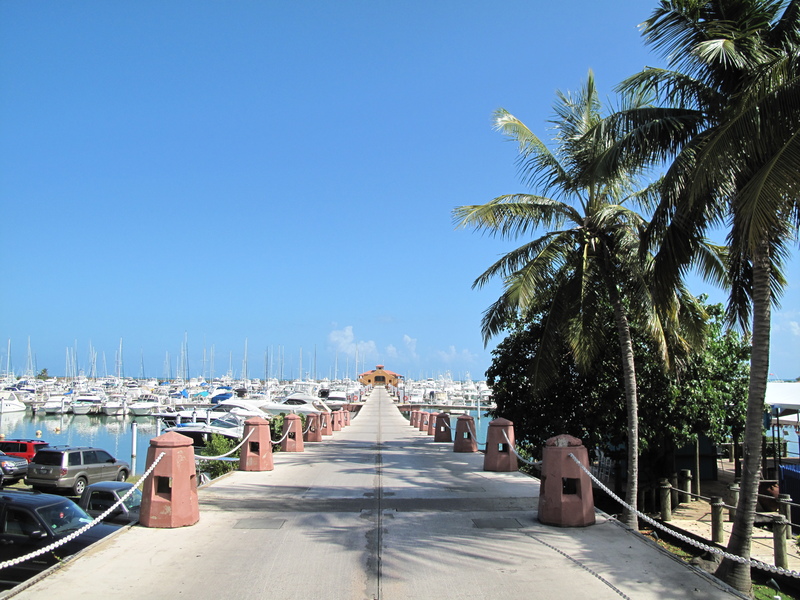 The drivers all seem to be in a great hurry to get wherever they may be going, and you are not going to slow them down! 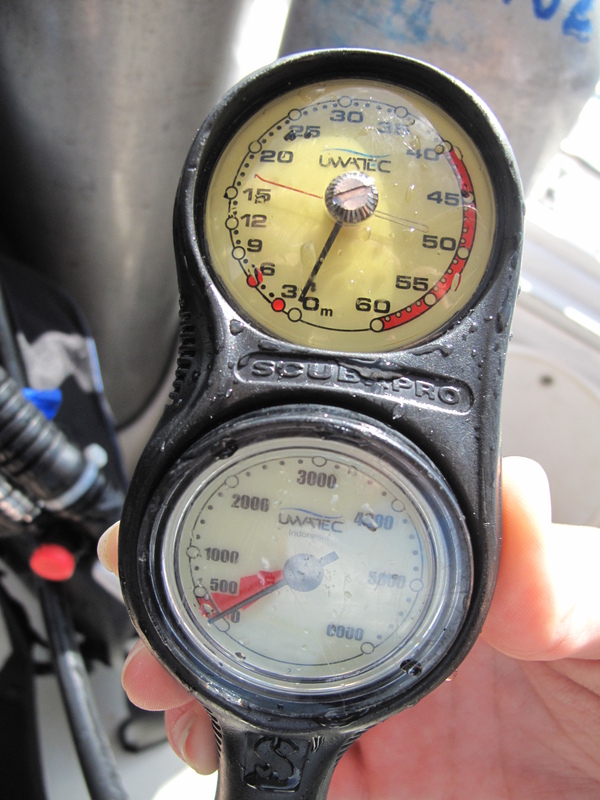 Once we made it [safely] to the marina, the Sea Ventures crew were ready on deck with all of the SCUBA gear neatly laid out and ready to go. 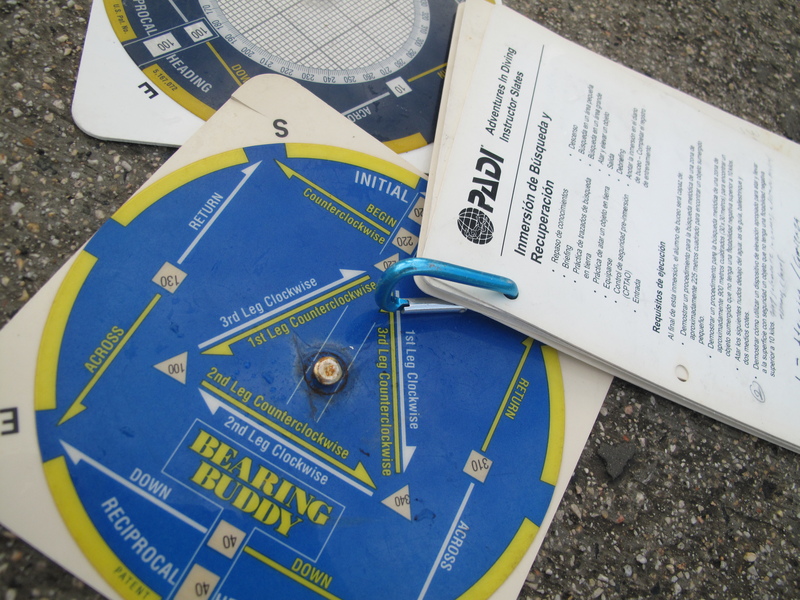 Before immediately boarding the boat, the students were given a 30-minute on land tutorial in basic navigational skills. They learned the concept of counting their kick cycles and following their compasses in both triangle and square patterns. This requires one to pay very close attention to their compass and their math, as each turn requires a simple addition or subtraction of degrees, varying on which pattern they are practicing. 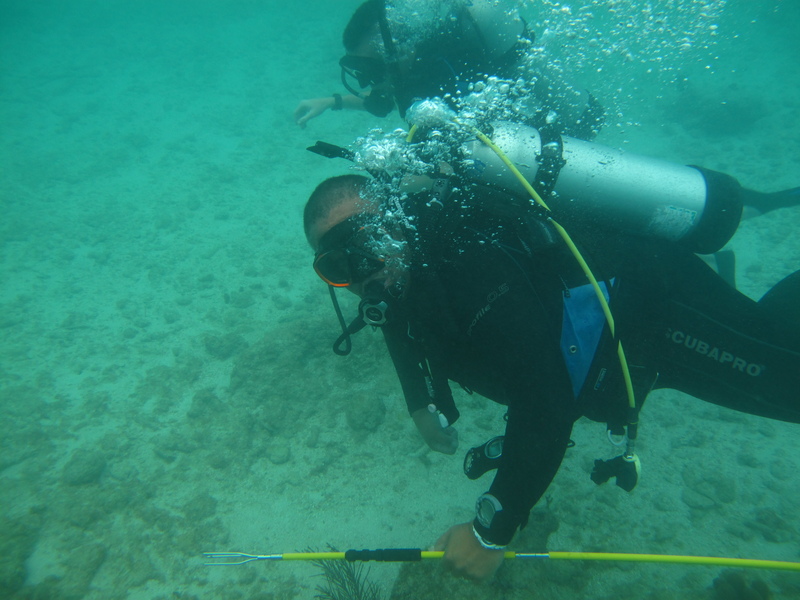 These skills are crucial in search and recovery and of course, not getting lost underwater. 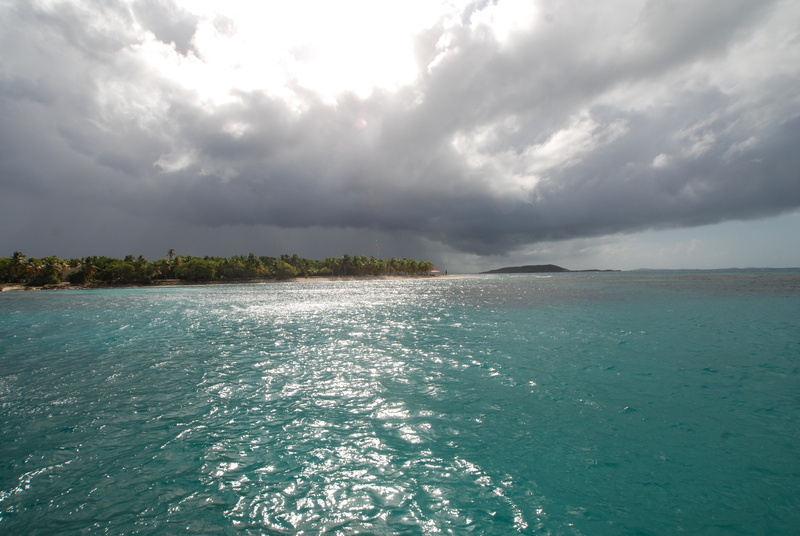 We left the marina with stormy seas, but it quickly cleared as we got further away from the mainland. 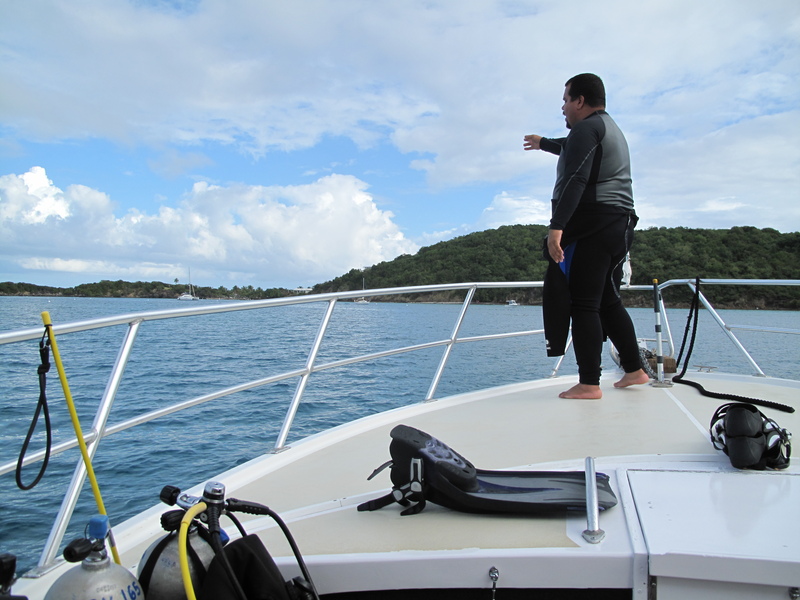 The boys were in for a treat today with some great visibility and awesome dive sites! 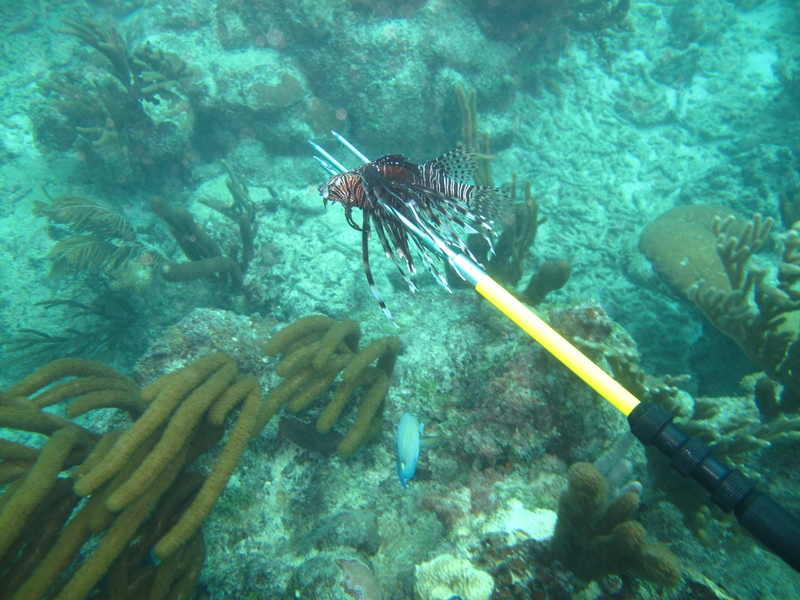 And of course, more lionfish hunting! 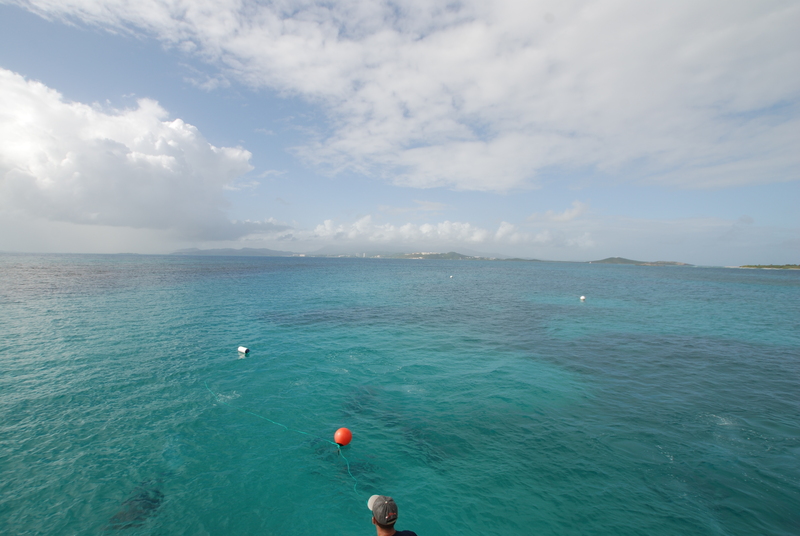 After the short boat ride to the dive spot, the waters had cleared to a beautiful, deep saphire blue with such great visibility, we could see the ocean floor about 60′ down. 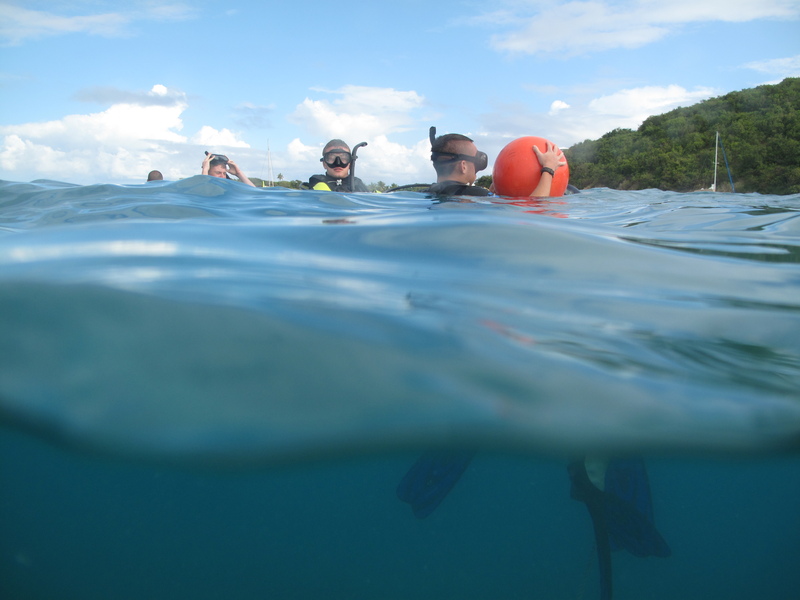 The students geared up, joined their classes, and after some brief instruction, dove in ready to practice their freshly practiced navigation skills in a search and recovery mission. 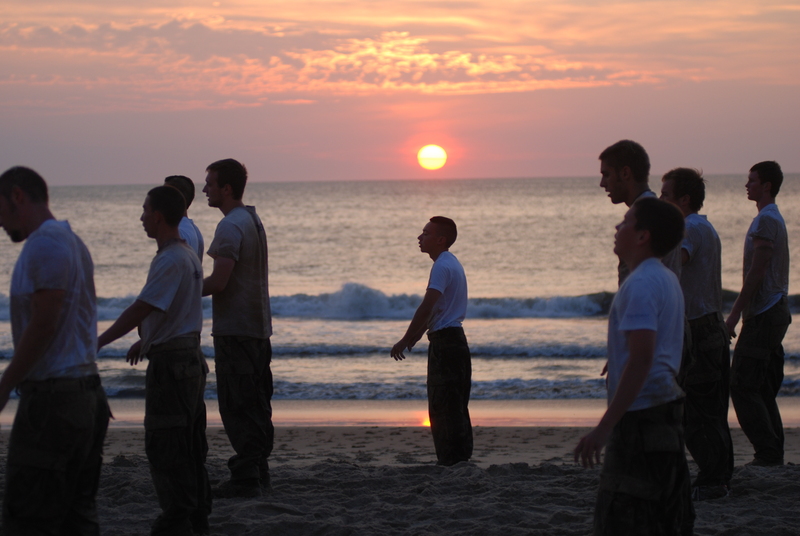 The morning started again at 0600 with an intense PT led by Fuch. After a quick 0700 breakfast, they were loaded into the van to drive to the marina for another day on the water. 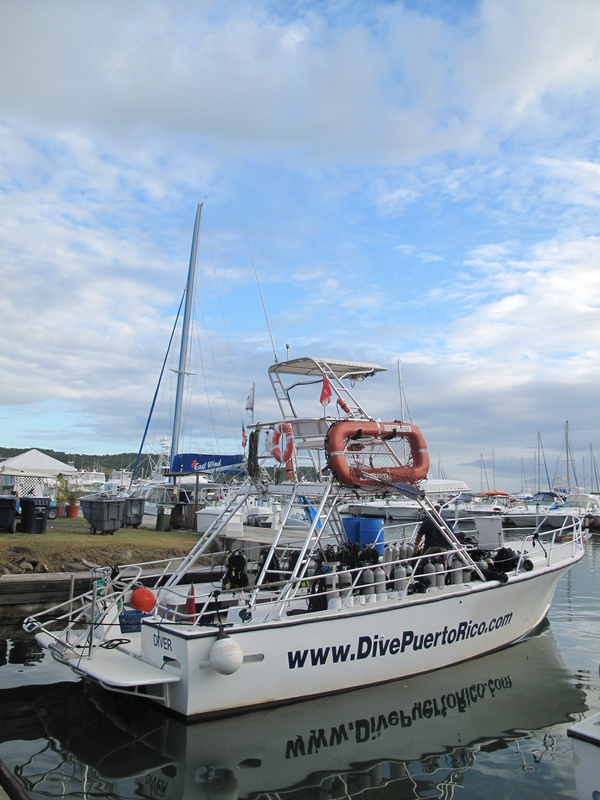 The dive staff already had all of the equipment laid out and ready to go; thanks, Luis and Joel! 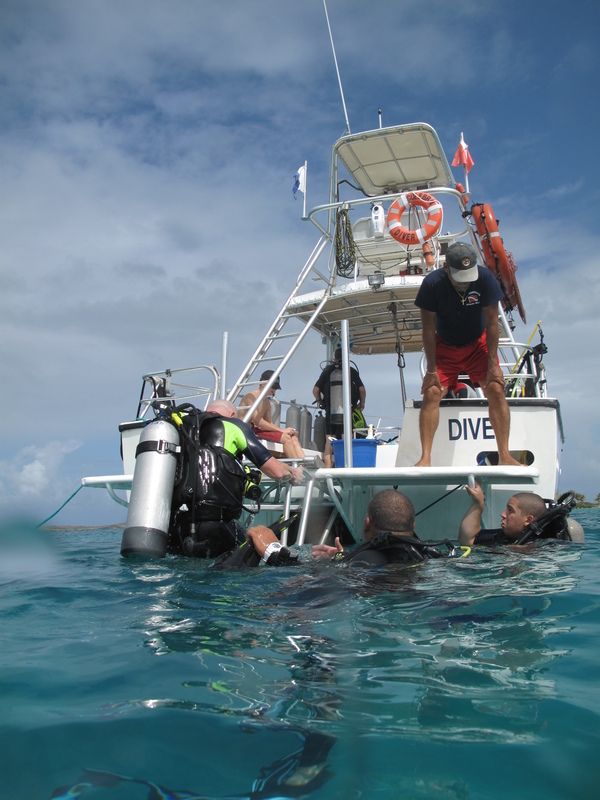 The dive crew did en excellent job preparing the students for the dive sites they were about to encounter and ensuring that all safety practices were acknowledged and followed. 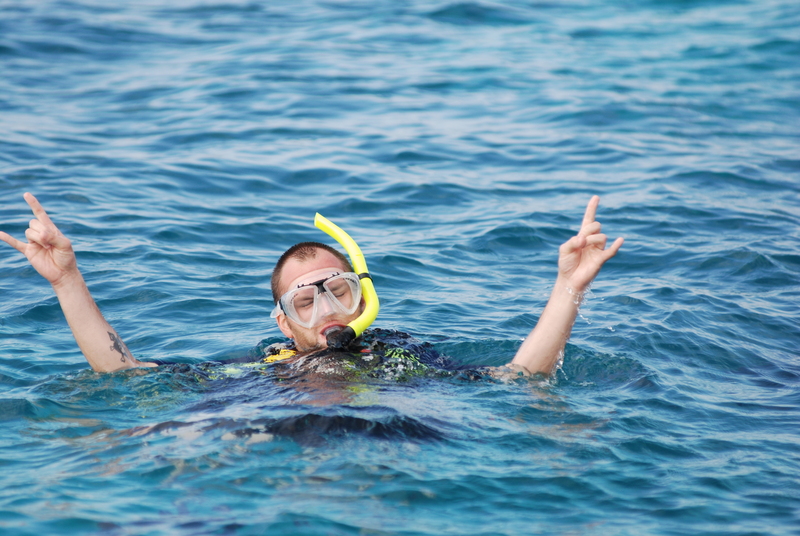 A couple of the students even got to practice a safe buddy-assent in the open ocean! 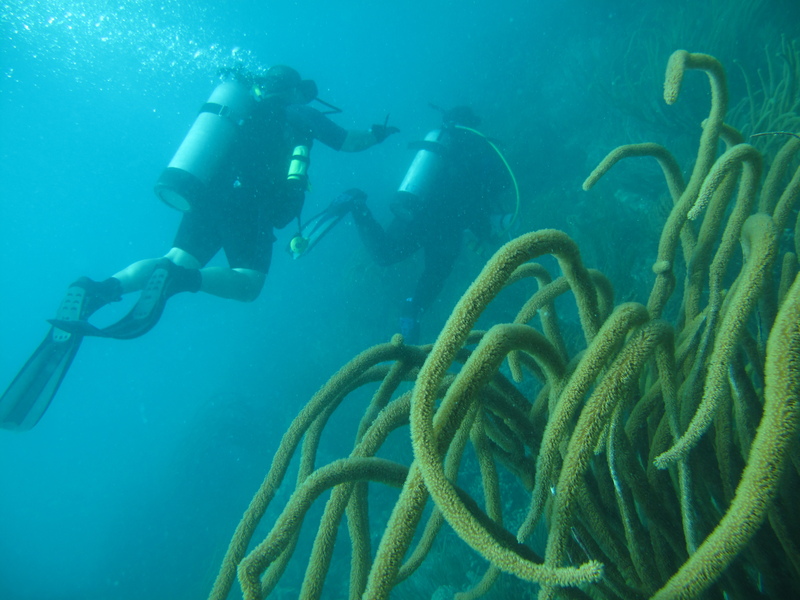 They were careful not to disturb the coral and got to explore many sites unique to the Caribbean while still getting the most out of their dives. 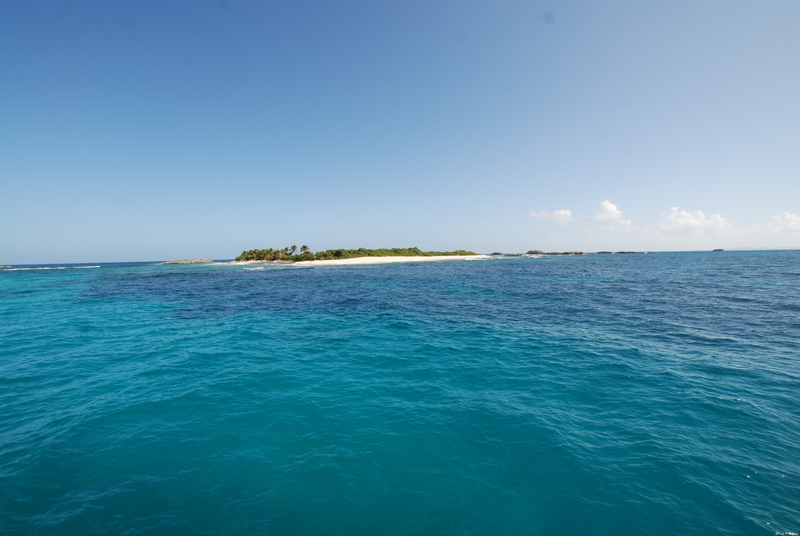 The view from the dive boat wasn’t too bad either! 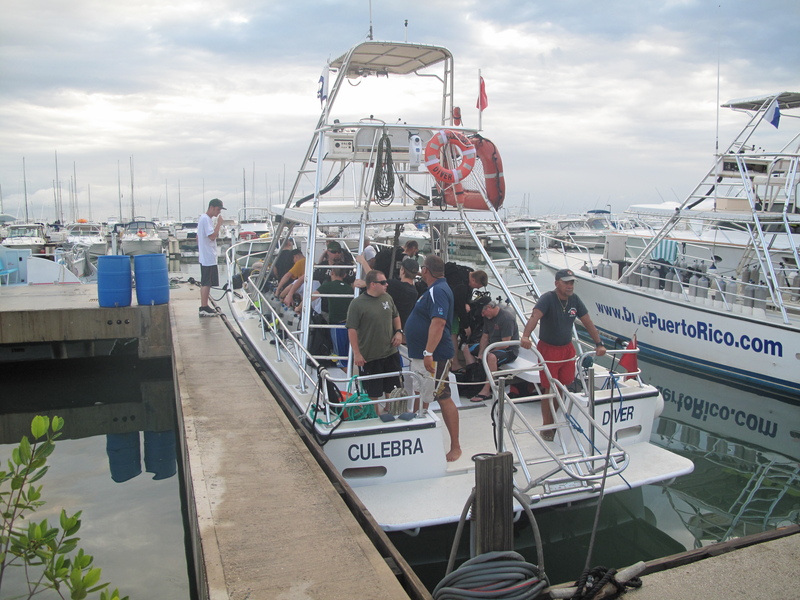 After getting in two dives, it was time to head back to the hotel, gear up, and load up in the van towards the Puerto Rican rainforest! 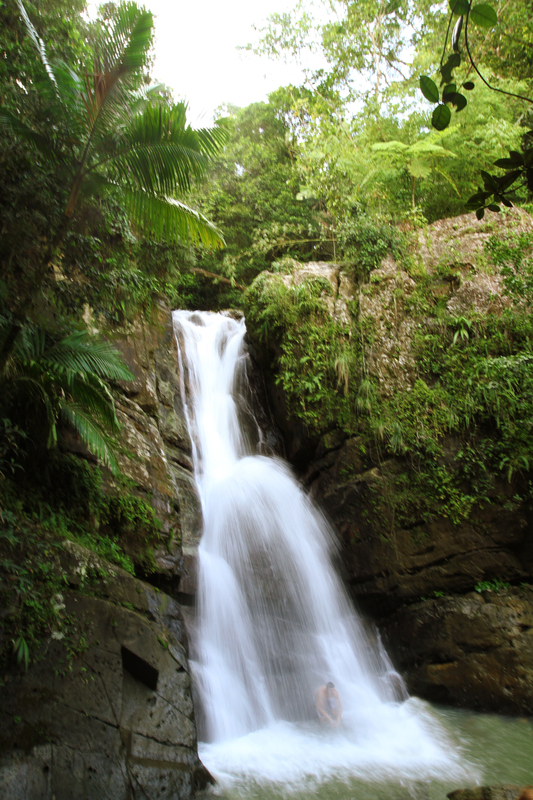 We drove through windy roads surrounded by lush, green vegetation up the mountain before reaching the trail head to the beautiful waterfall/ swimming hole. 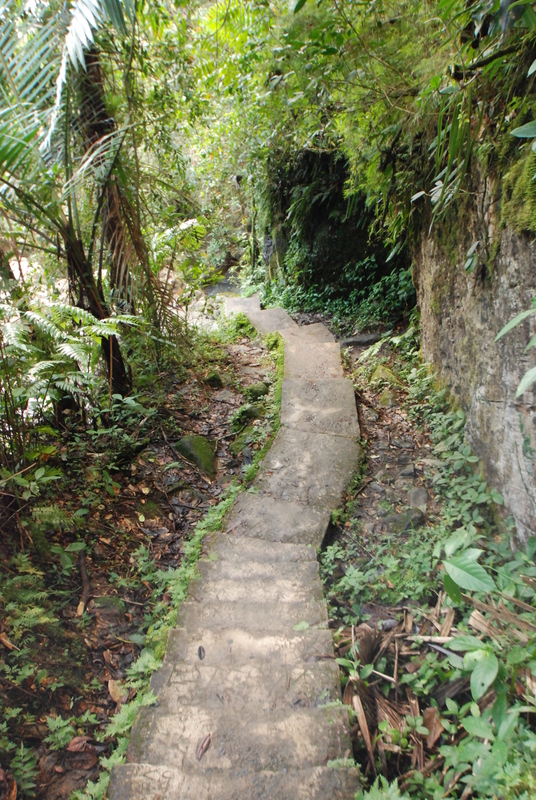 The trail was mostly concrete though the forest, with plenty of step and slips along the way. 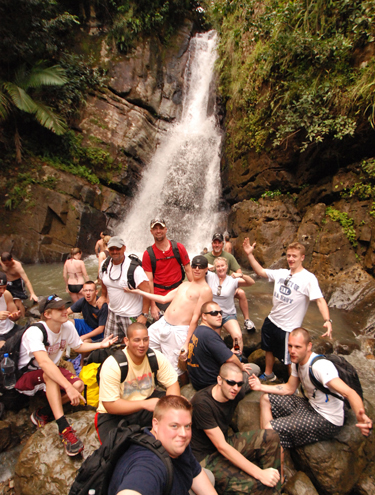 Once we reached the falls, several of the students got to enjoy a dip in, refreshing water before heading back up to the parking area. Following the journey to the rainforest, we were treated to a delicious dinner back at the hotel served poolside by Mama Shipley and the girls. 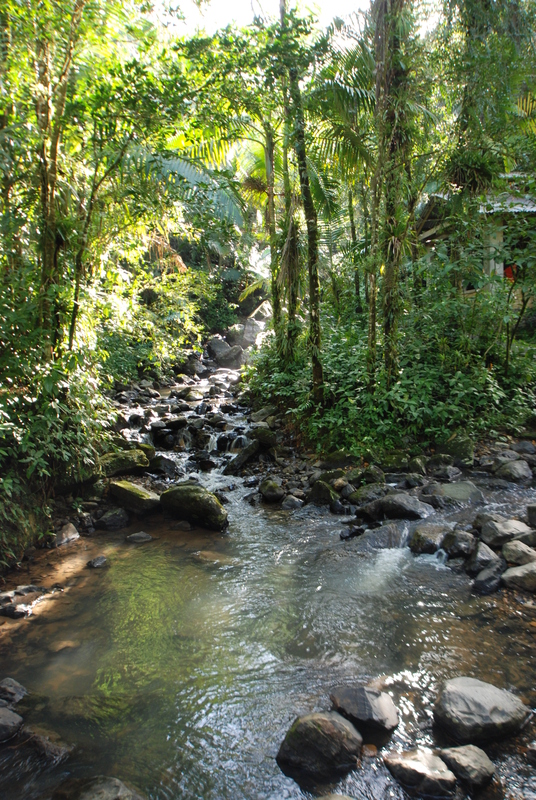 It was a delicious spread of treats and meat, just what the students needed after a morning in the water and an afternoon in the rainforest. They relaxed poolside into the evening, exchanging stories and sharing complex discussions before heading to their rooms to get some sleep before another 0600 PT session. 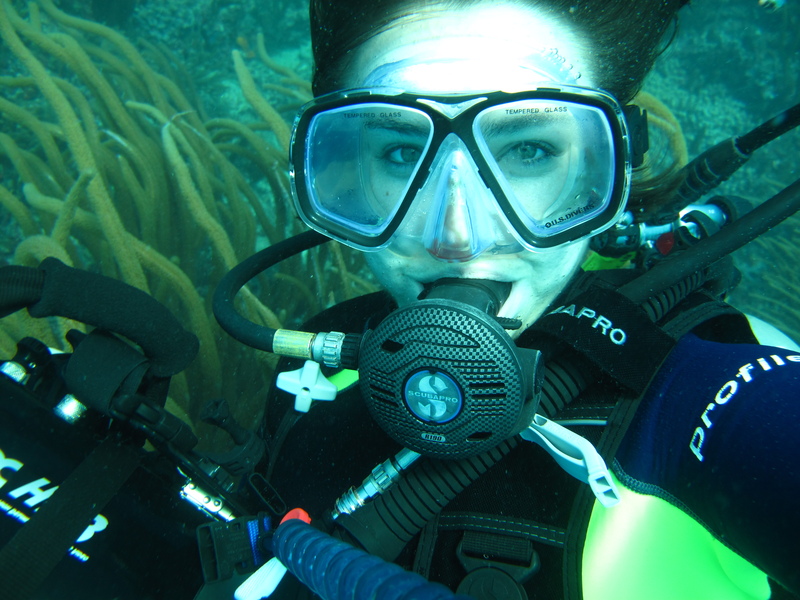 Swaggerjack Productions would like to thank the wonderfully talented Kristin for her dedication to underwater videography and amazing photography skills! 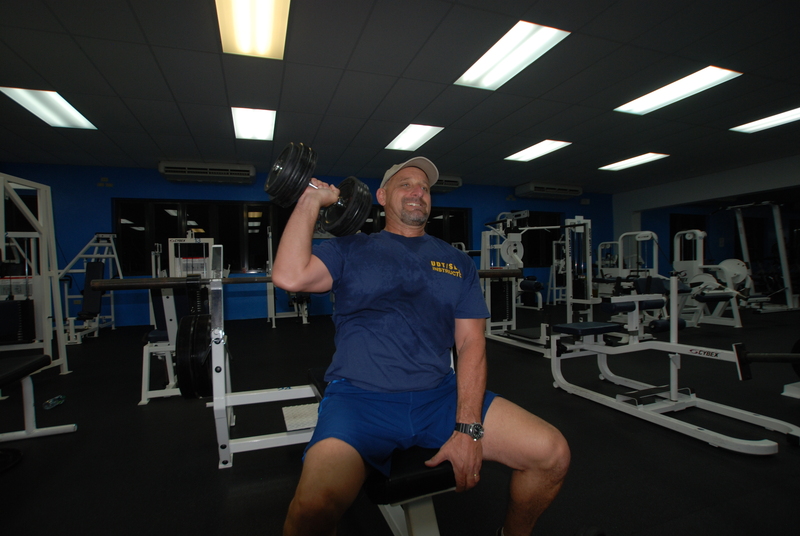 The morning came quick with an 06:00 PT in the hotel resort’s gym, led by Chief Fuch. The students challenged themselves to run just a little further, bench just a little more, and work just a little harder than they had the day before. His goal seems to be encouraging each student to reach their fullest potential and push themselves that extra bit to surpass their best from the previous workout. The students were having fun in the gym and genuinely enjoying the challenge, proud of what they had accomplished. 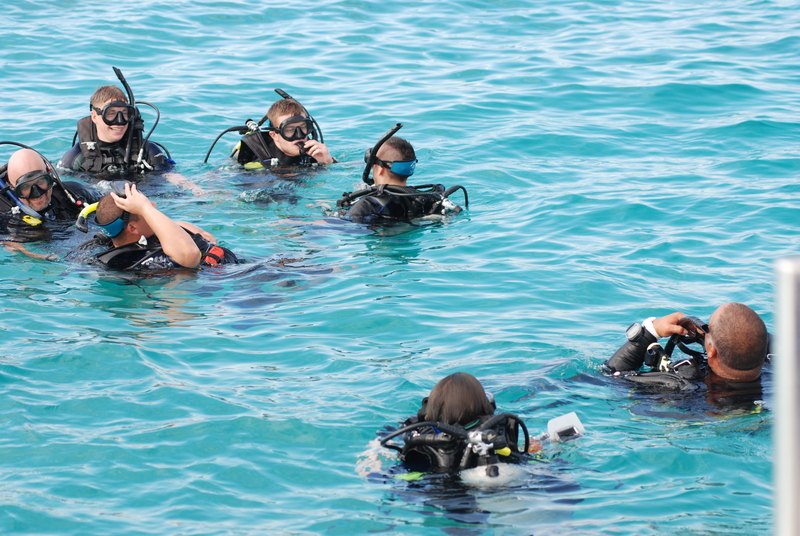 PT ended with a trip poolside to enjoy another delicious spread of breakfast foods before departing the resort for the the marina, where the students would get on the dive boat and get to put the skills learned previously in the pool to use in the wild, untamed ocean. 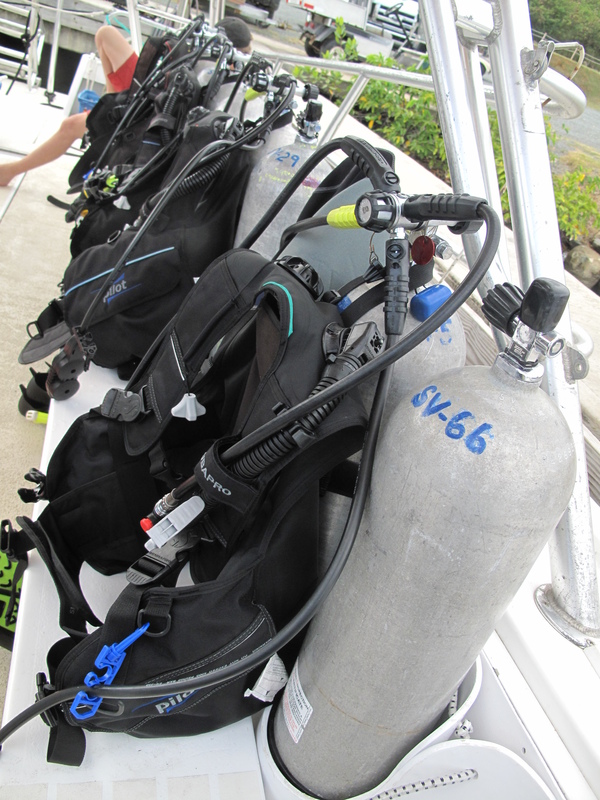 The divemasters had all of their gear ready to go and the students got their first tastes of saltwater while exploring the beautiful reefs under the Caribbean sea. 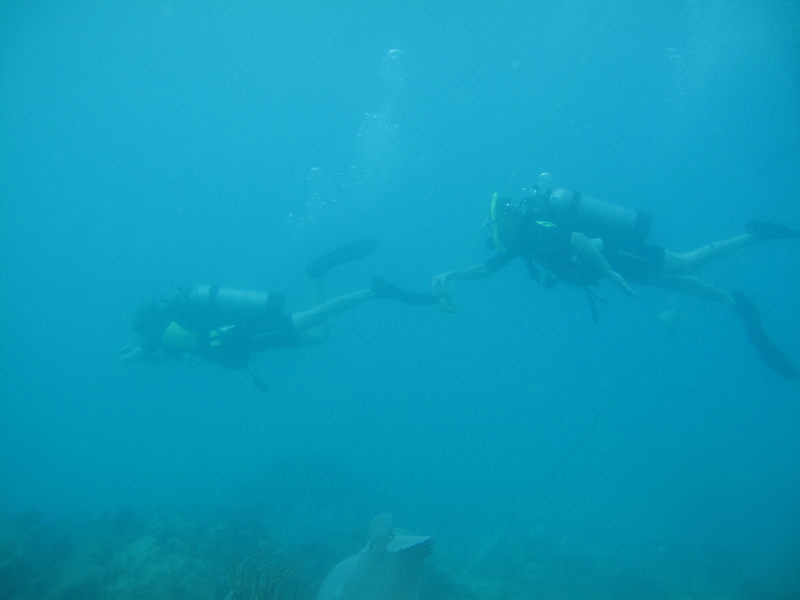 While diving, the students got a short lesson in Lionfish hunting from the divemaster. Lionfish are native to to Pacific ocean, not the Atlantic, so they have no natural predators here. They are considered an invasive species because of this and the fact that they eat the native fish. 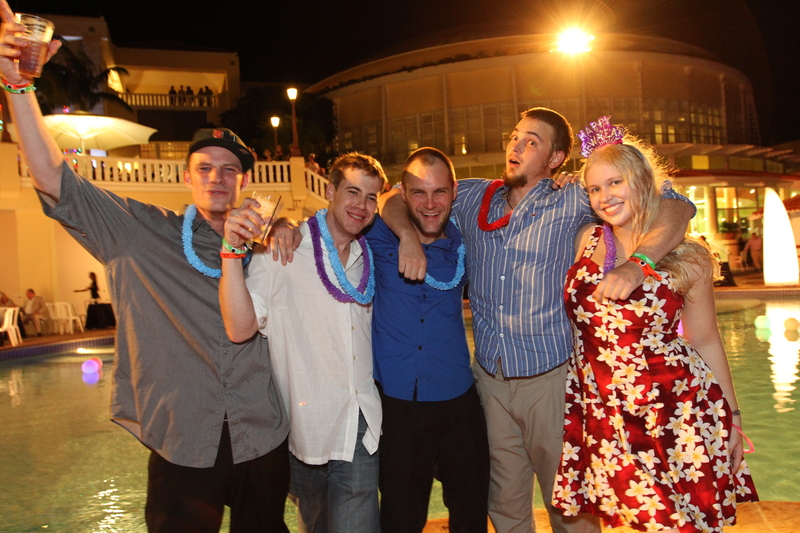 New Year’s with Swaggerjack and the EXTREME SEALs!!!!! We have finally made it to Friday, the final day of the class. This afternoon the students will graduate and celebrate this past week, an accomplishment that will make them proud the rest of their lives. There is no PT this morning, as the “Monster Mash” is scheduled. This consisted of a run from the river to the lake, a swim across the lake, flutter kicks, more running, pull-ups, dips, more running, more swimming, and ending with even more running across the field to the finish line, where ice cold Gatorade awaited them. 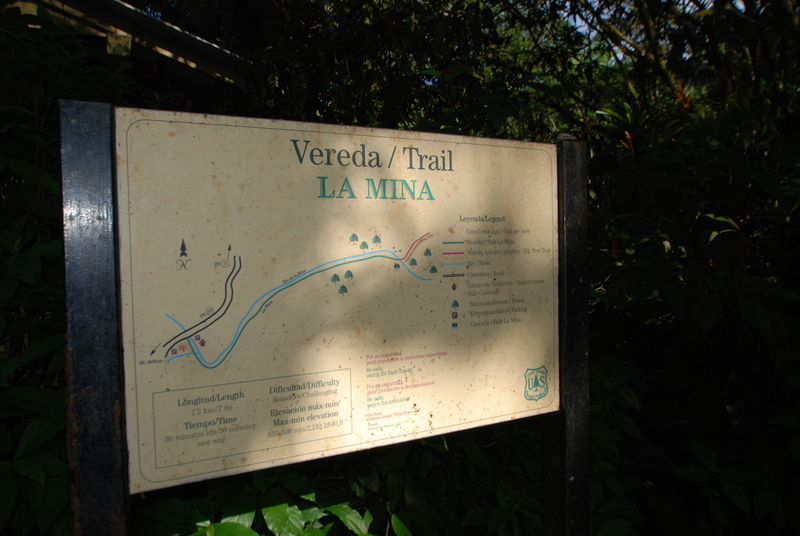 The men started today by loading up their swim gear and getting on the bus for a short drive to the river. 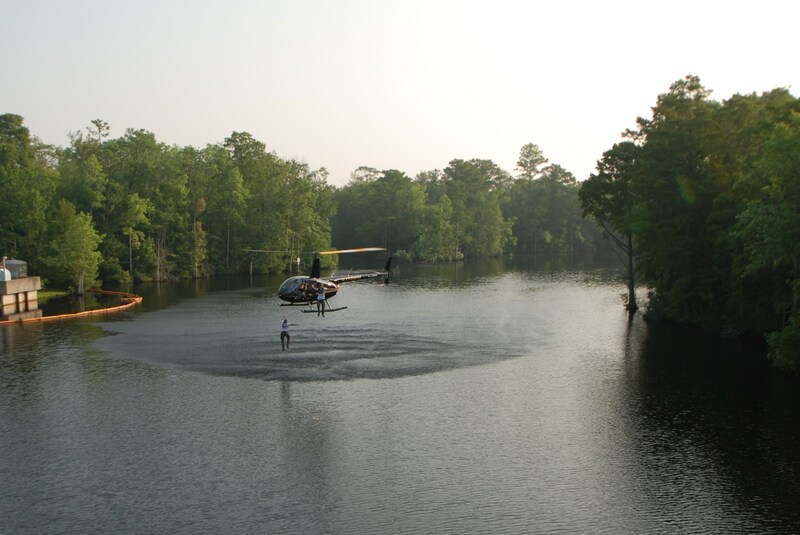 Shortly after we arrived, the helicopters made their entrance, ready to give each student a ride he’ll remember forever, ending with a 25′ drop off the skids into the river and a swim to shore. 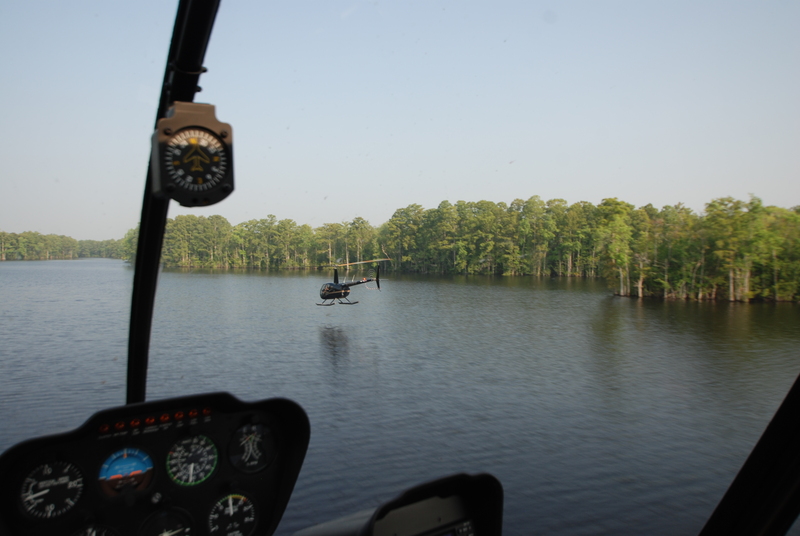 The men loaded each helicopter two at a time and had a brief, invigorating ride closely following the twists and turns of the river with exciting bank turns often triggering warning lights and alarms. 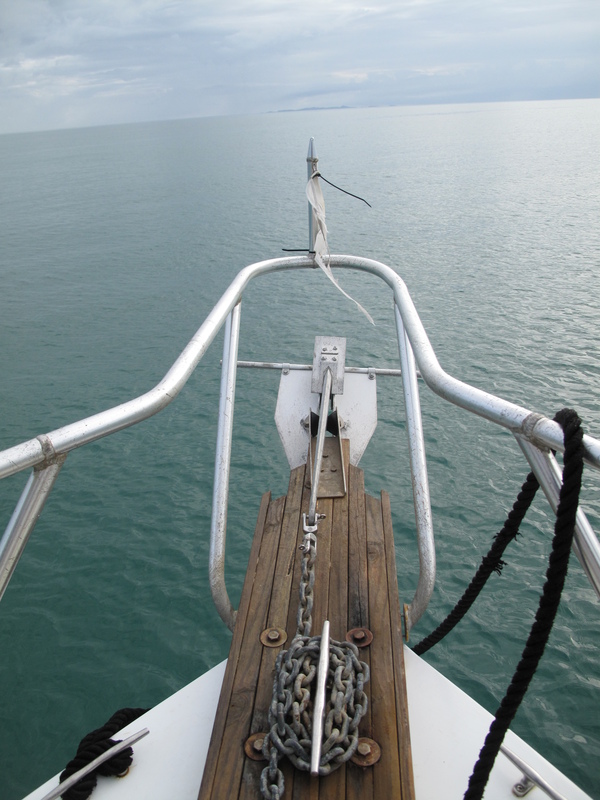 There were times where the skids almost touched the water. The pilots also maneuvered very closely together during strait-aways as well as coordinating bank turns for us to get the best shots highlighting their skills. 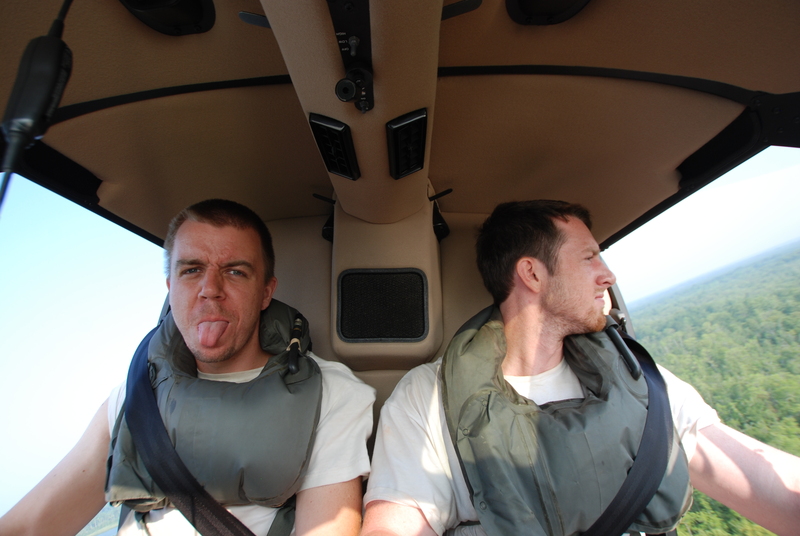 Out of all of the helicopter flights that the SwaggerJack crew has taken, these were certainly the most daring, brave, and talented pilots. At one point, near the end of the flight, the heli banked through turn after turn after turn, then continued strait towards the treeline, making everyone think we would crash. At the very last second, the pilot pulled the craft up and over, gluing us to our seats, then pointed the nose down as we crested the peak to create a zero-g effect, often making ourselves and the students float out of our seats, or at least feel weightless. The pilots really were amazing. Shortly after the zero-g thrill, the pilot would shout “Stand by!” to the men, signalling them to unbuckle their seat belts, refasten them behind their backs, and step out onto the skids while holding a support bar. 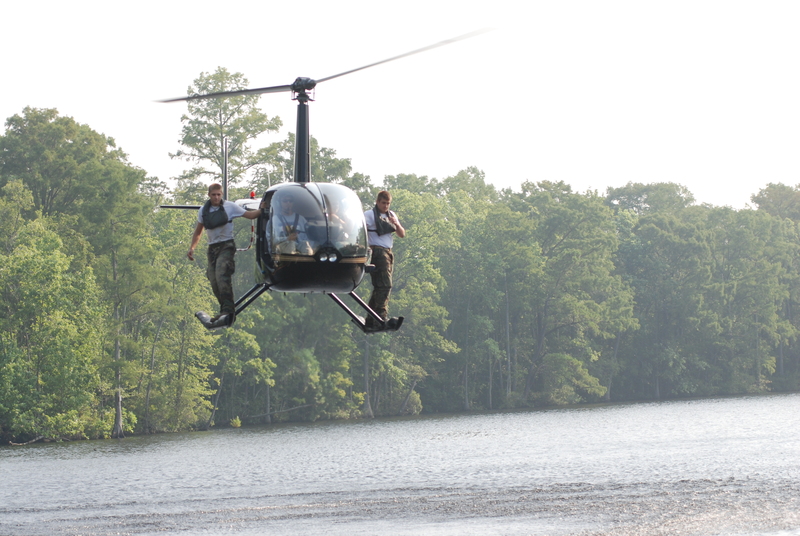 This was their ready position to drop into the river. 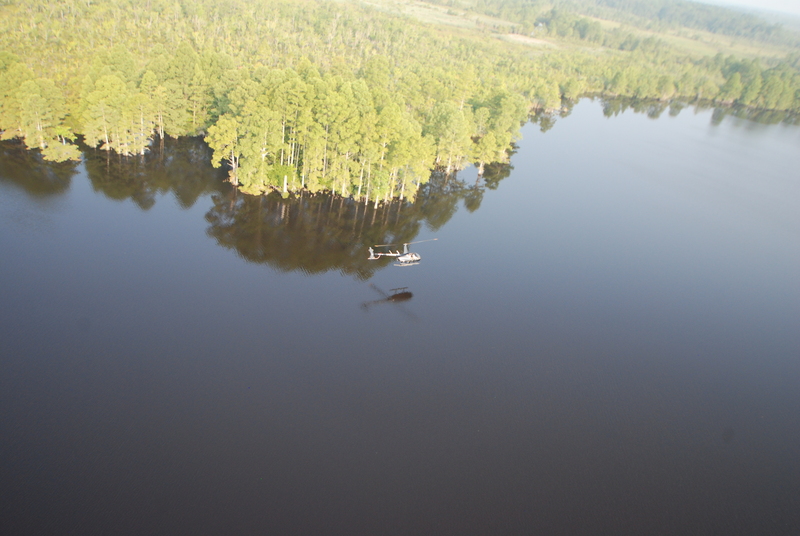 When the heli was hovering over the correct area, the pilot would shout “Bust ’em, bust ’em, bust ’em!”, signalling the men to step off of the skids and drop into the water. Even though this was the first time in a helicopter for many of the men, not a single one hesitated when he was instructed to drop. Once they resurfaced, they swam to shore to be greeted by Chief Fuch and Senior Cheif, then enjoyed a short break before beginning the Monster Mash. 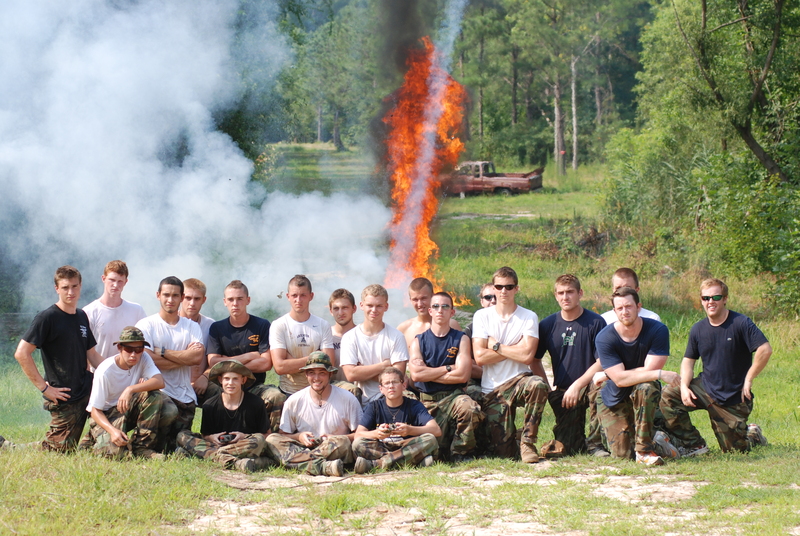 The men completed their grueling Monster Mash within 45 minutes, and each had a quiet celebration for their completion. This signified the end of their course, they had passed their final test. They were ready to graduate EXTREME SEAL EXPERIENCE. It was a simple ceremony, with a few special acknowledgements of standout students, and beautiful thank you for the camera crew, and each student receiving his graduation certificate and letter of recommendation for the BUD/S training course. 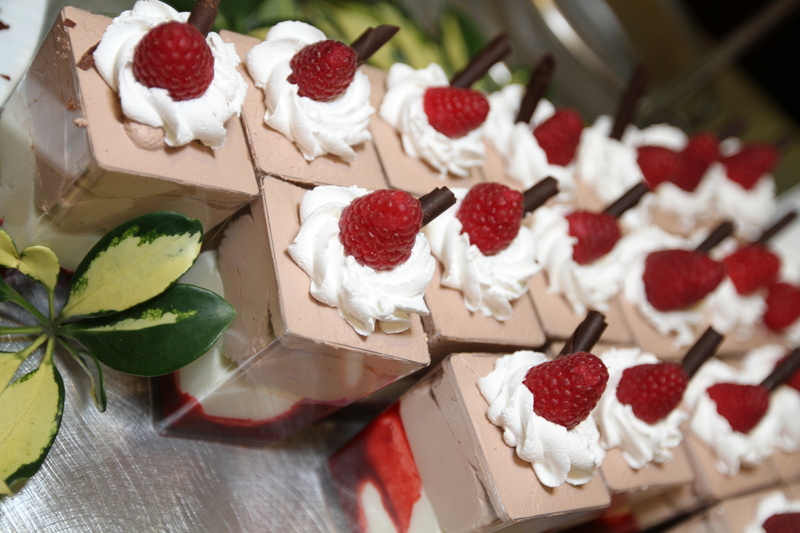 Now it was time to celebrate, reminisce, and for the men to enjoy their last day with their new found brothers. Thursday morning’s PT started with a warm-up of basic moves, then transitioned to a fun touch-football scrimmage between the shirts and skins. 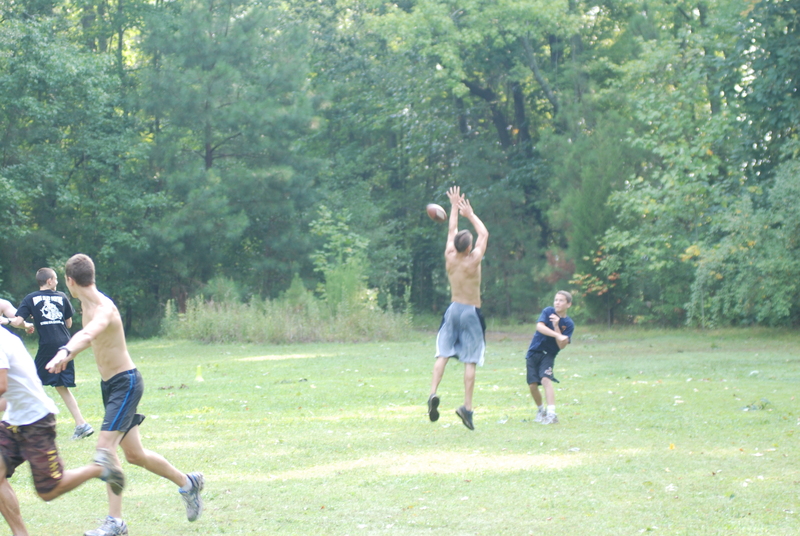 Once again, the men split into their teams and took turns playing each other on the field. Once one team scored, the other team would take over to play the winner. This was a good way for the guys to get in some PT and have some fun, all while relieving some of the week’s stress with the game. 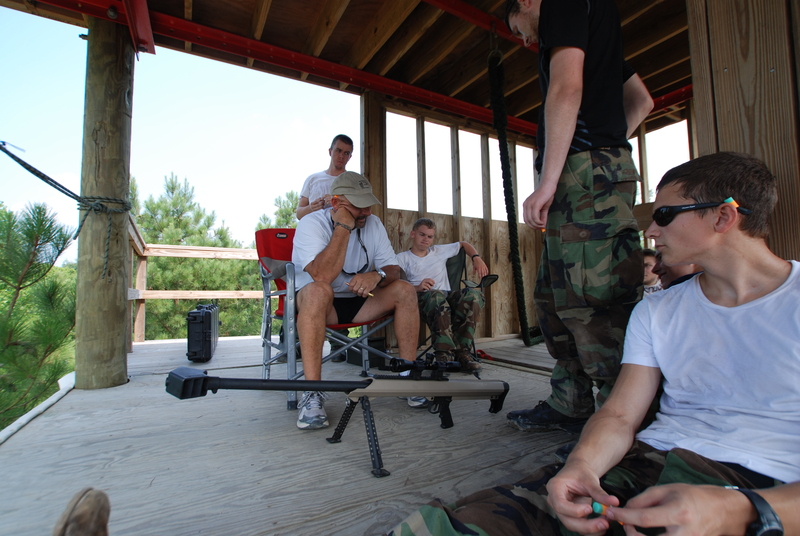 After PT, there was a brief break before loading up the bus to travel to a local air soft field with a 48’ rappel tower and generous firing range. 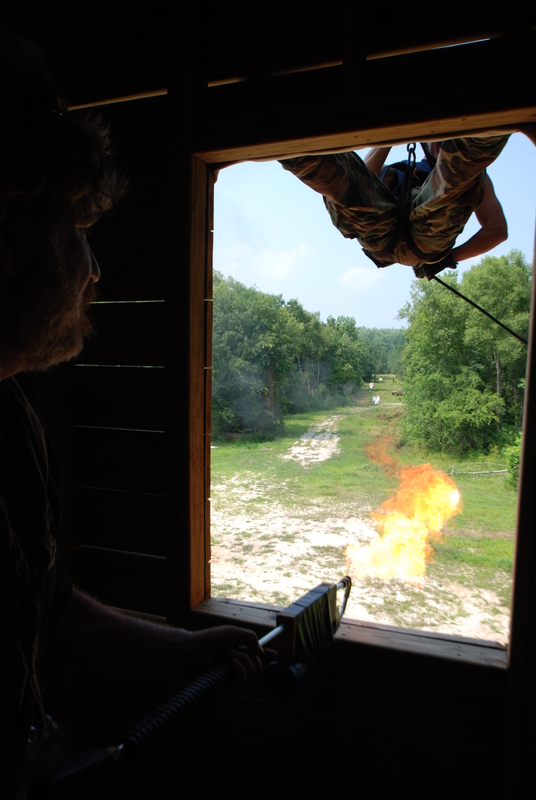 Today’s activities included rappelling, fast roping, and shooting a wide variety of weapons, all while the heat index climbed to 114°F. For the men on their second week of class, they started lessons on all the different artillery the instructor’s had available. 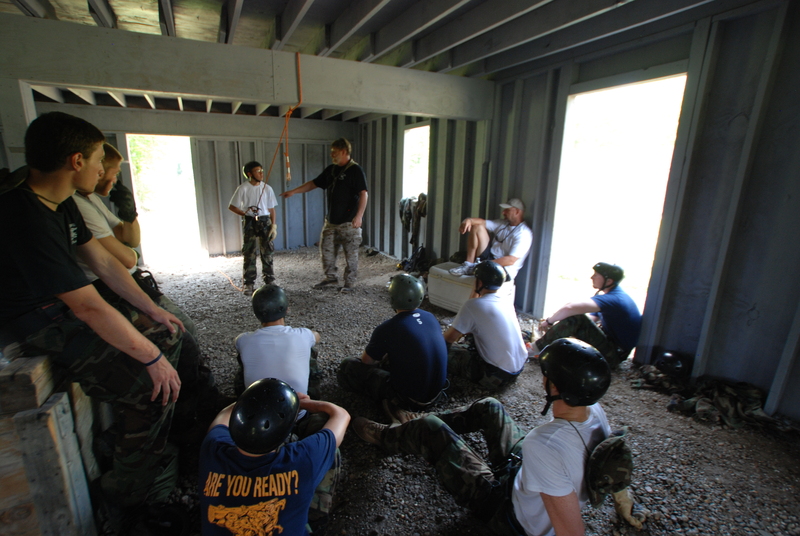 The men on their first week were briefed on rappelling, issued gear, and climbed to the top of the tower. Luckily for the camera crew, Senior Chief Don Shipley was more than willing to let us get in some of the action too, setting us up with harnesses so we could rappel and film while going down the tower. 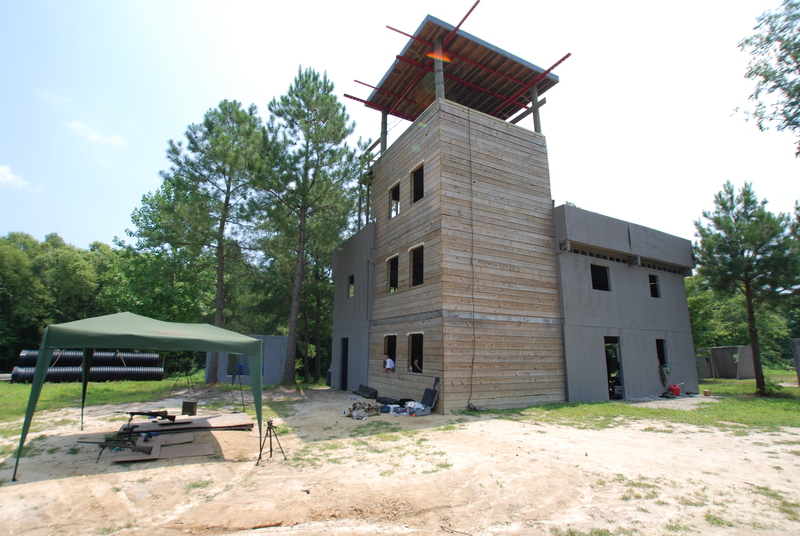 Not only did we get some awesome footage, but we all got to share in the same experience as the men, conquering our own nervousness by rappelling strait down this 48’ foot tower, even “Aussie Style!” After the rappel lesson and practice, it was time to shoot the .50 caliber Barrett from the top of the tower. Once again, Senior Chief was kind enough to allow the camera crew get a piece of the action, each getting their turn to shoot, even allowing the first shot to be done “ladies first” by our own camerawoman, Stefanie. 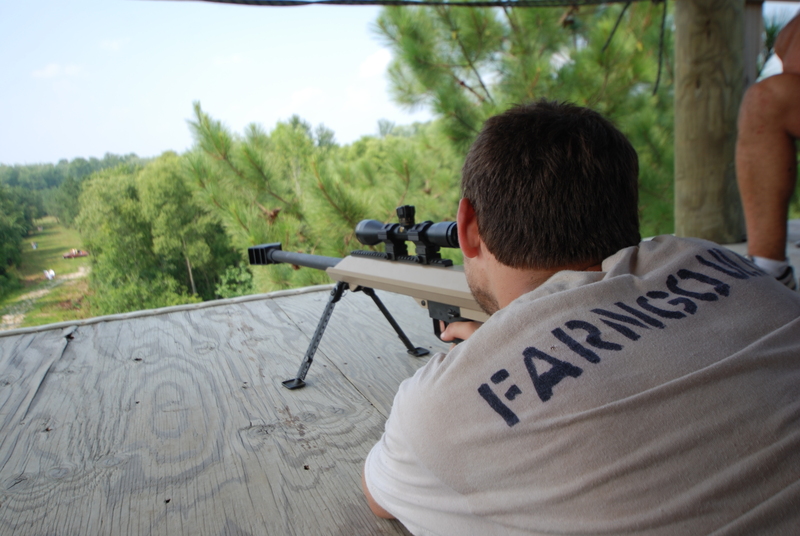 The .50 caliber Barrett has a specially designed muzzle which projects the pressure through special vents, making the recoil much less than what one would expect from such a large gun. In turn, this causes a shockwave which damages hollow organs, shakes the ground, and causes nosebleeds and headaches after several shots by one shooter. 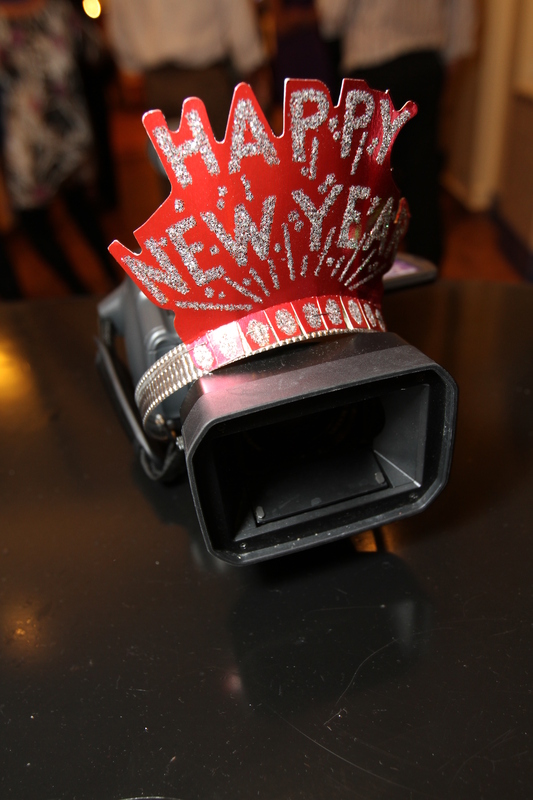 The bullet is capable of travelling over 5 miles and the longest recorded accurate shot was clocked over a mile away. 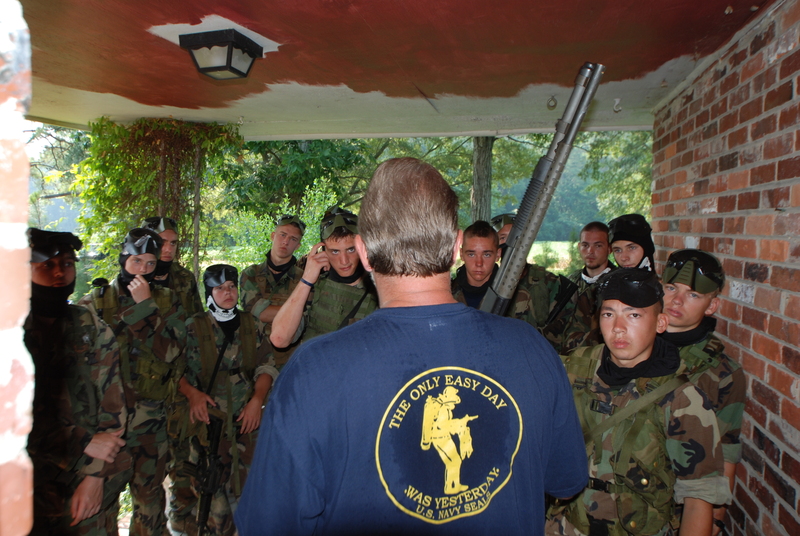 While that team was rappelling and shooting the .50 cal., the other was practicing shooting a variety of firearms including M-4’s, M-14’s, 9mm pistols, .308 sniper rifles, and a .40 caliber Glock. 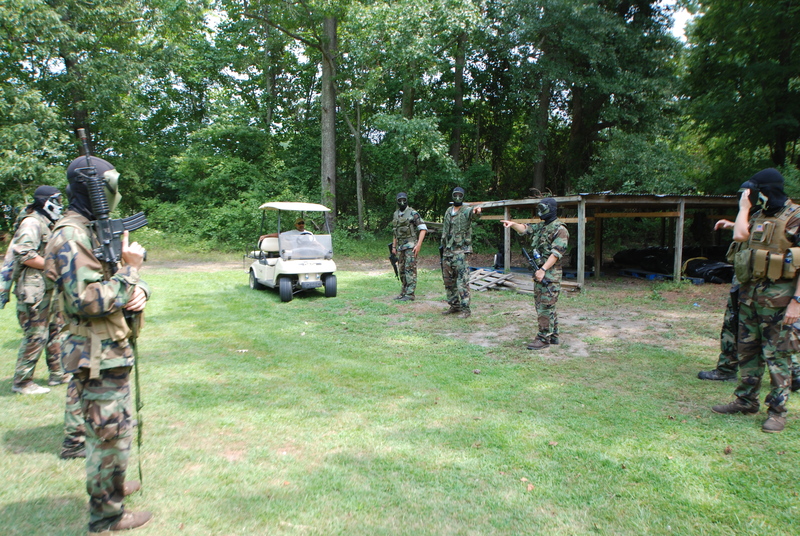 They were practicing double-taps and shooting balloons at a variety of distances. They also had pre-mixed containers of explosive material which they shot, being quickly rewarded for hitting their target with a loud explosion. 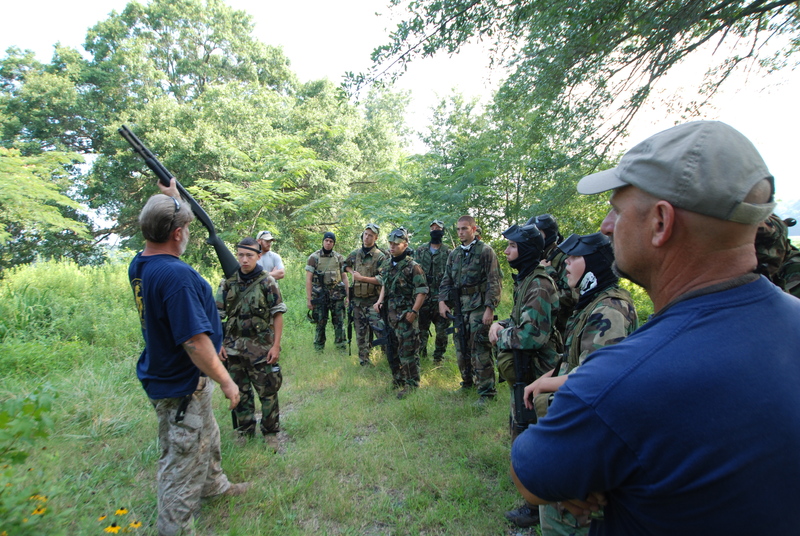 Once each group had completed that area of training, they switched. The ones rappelling were now shooting and those shooting were now rappelling. 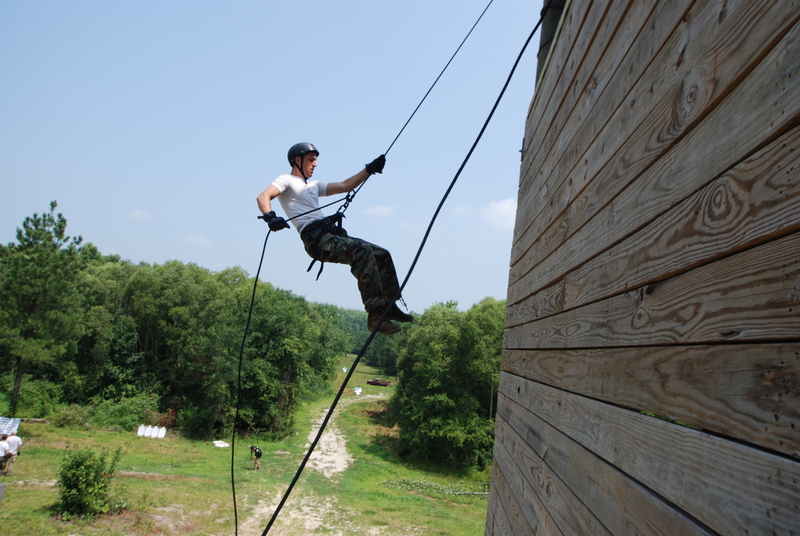 The men now rappelling were on their second week and had previously rappelled the week before, so they practiced more advanced techniques, such as swinging directly in and out of windows while performing a controlled drop down the building. This was a particularly fun challenge, as the men were directed that the proper technique included yelling “weeeeeee” while swinging in and out of the windows. 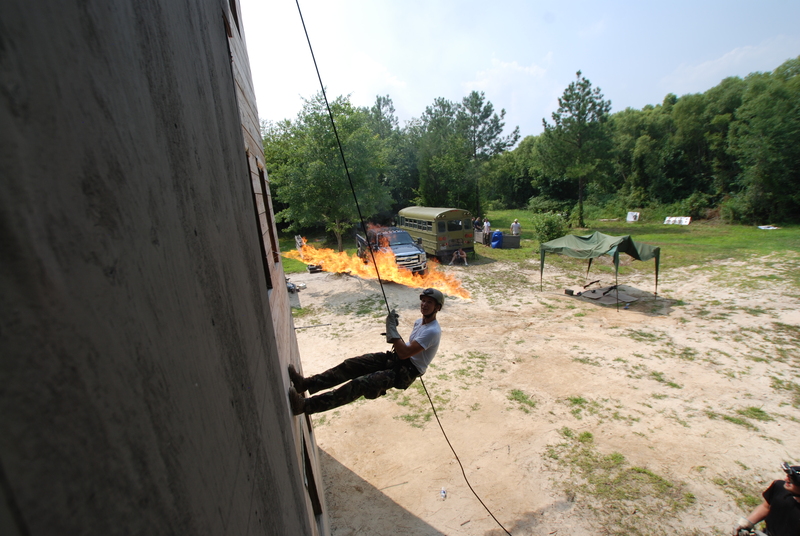 Also, Senior Chief added another element of danger by shooting his flamethrower through the windows and the men rappelled down. As one would imagine, there were also many crashes into the window frames, provided some entertainment for men. 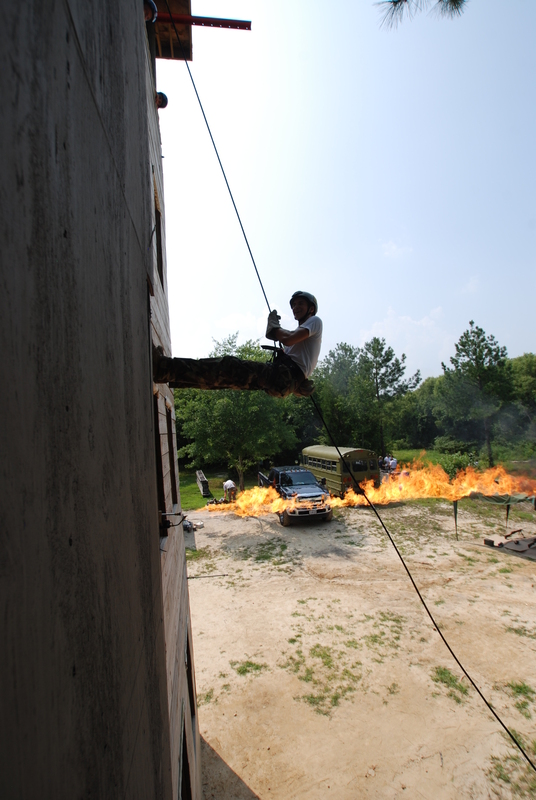 Before leaving, the mean each got to “fast rope,” a technique where they grab the rope with their hands and slide down it as if it were a fire-pole, without using their feet for stabilization. This technique is also considered a controlled fall. By the end of the afternoon, everyone was exhausted and ready to hit up the local rope swing. So after getting back to camp and unloading equipment, the men enjoyed a good dinner and a fun evening at the local rope swing at the lake. 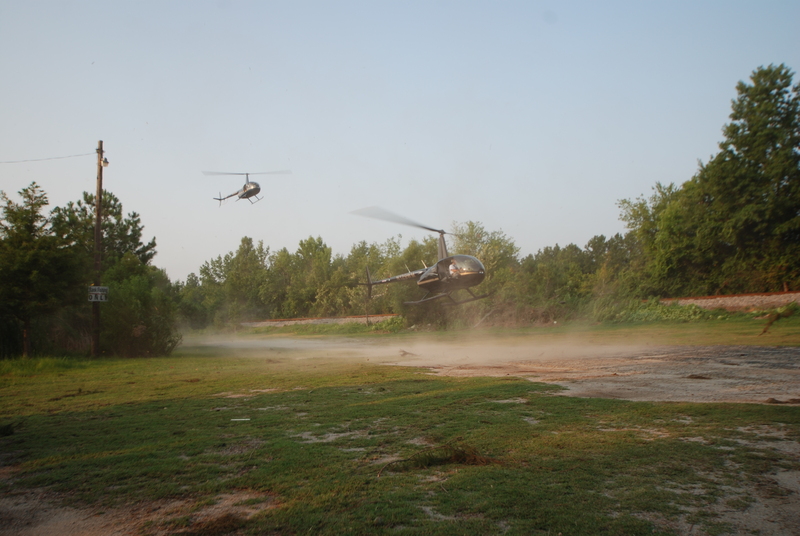 Tomorrow morning is going to be their last physical challenge, the “Monster Mash,” as well as their heli-casting training. Wednesday started bright and early with some PT including a nice jog through a wooded trail. 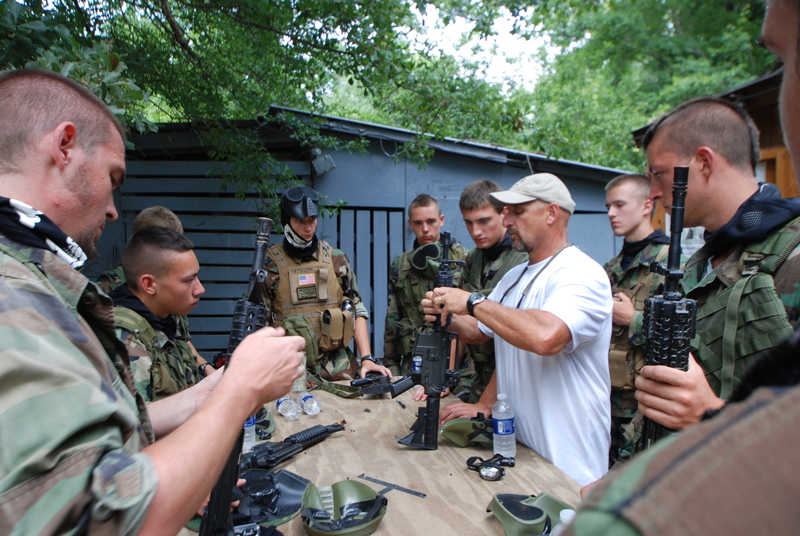 Shortly after finishing, the men were issued gear and loaded up the bus. 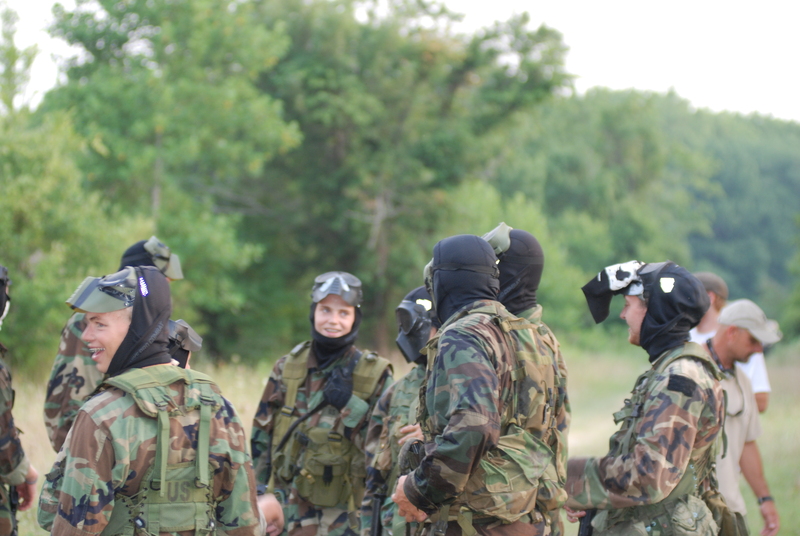 They were on their way to a beautiful farm field with two amazing large, decrepit abandoned houses for some CQC training with live air soft rounds. 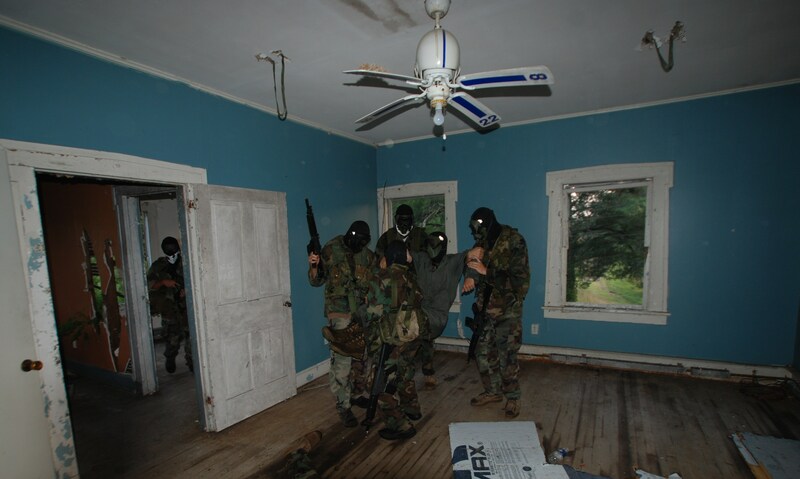 The men split into teams, one to defend the house and one to seize it. They practiced shooting in the door with shotguns, then using explosive charger devices. Once the main entry door was breeched, the men would form a train and meticulously work their way through the house, room by room, clearing each area and shooting any opposition. Each team did several runs before loading the bus back up and driving back to camp for an afternoon break before coming back to these farm houses for some night runs. 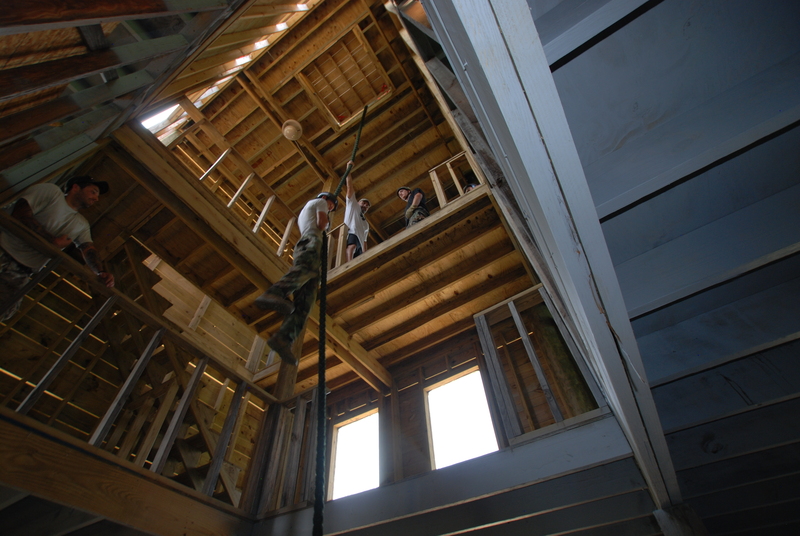 For the night runs, the men switched from a one-story house to a two-story house, adding the danger element of a stairwell. 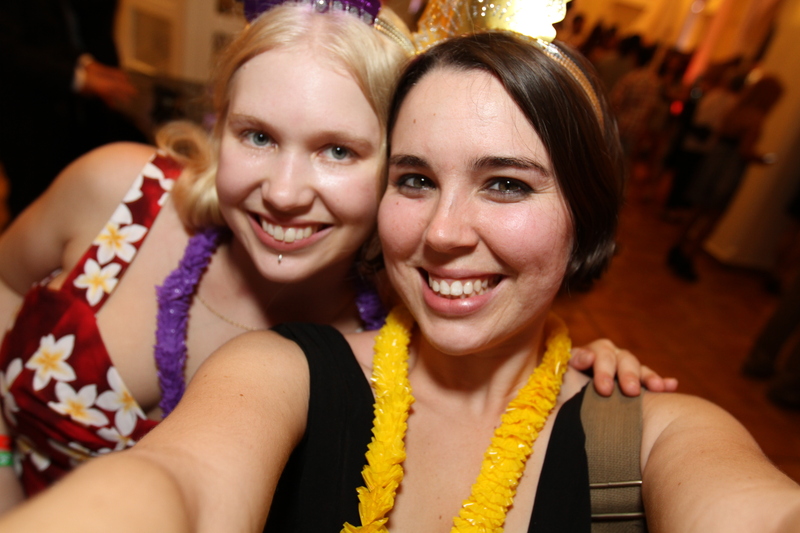 Once again, they split into teams and one would defend the house while the other would seize. 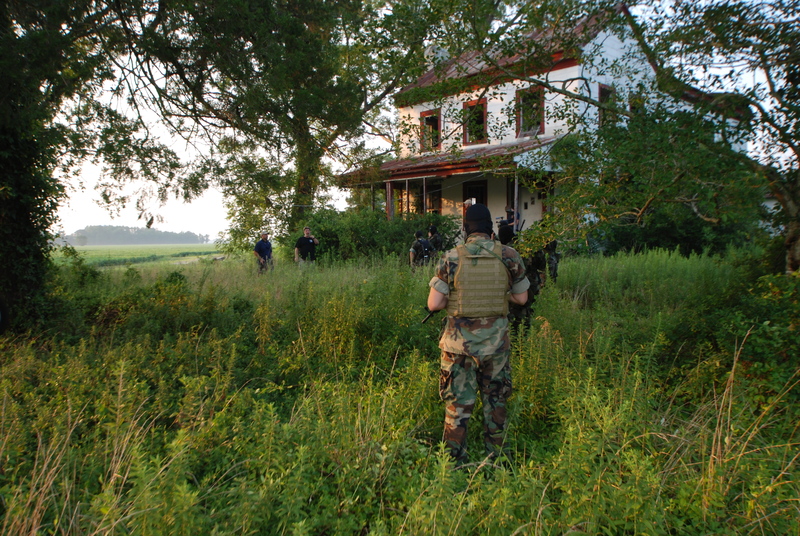 On some runs, the men seizing the house would also be on a rescue mission, trying to save one of their own from the “terrorists.” They did several runs into the night, each becoming progressively smoother and more intense. The night ended on a high note, with a well-executed run initially breeching two doors with both the 12-guage shotgun and explosive charger. 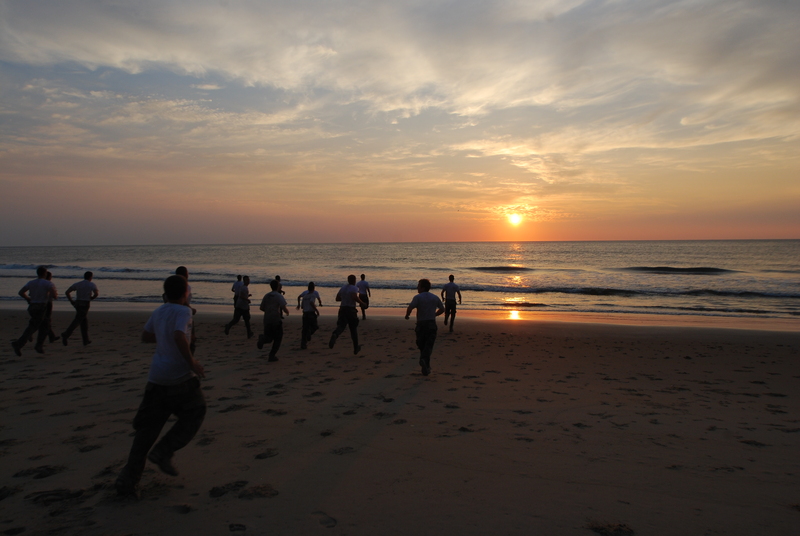 The men were eager to rinse off and get to bed, as tomorrow was another early morning with PT starting at 0700. Today started at 0500 hours, waking, readying the camera equipment, and heading to the beach to film the team’s sunrise PT session. The sun rose at 5:59am, just as expected, with all of its beautiful glowing coral glory, all while the men were transitioning between pushups, flutter kicks, and many other PT exercises. 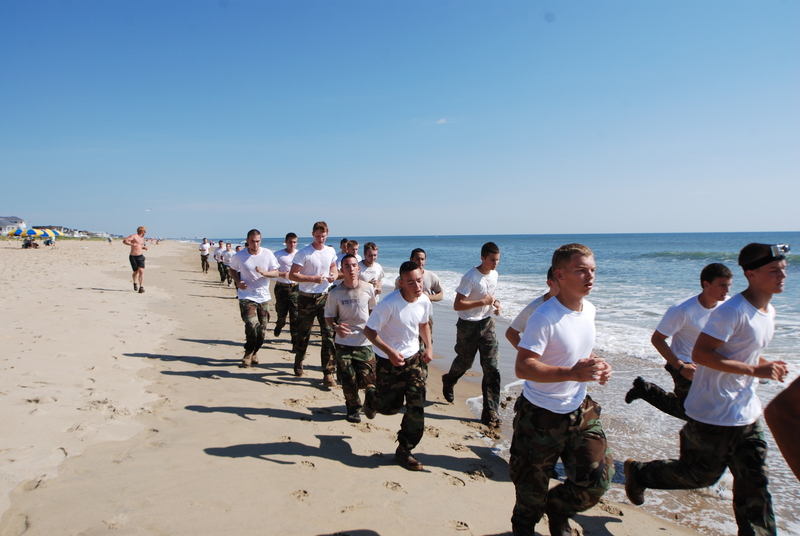 After watching the men lunge, run, and bear-crawl up and down the beach, they were led in a long run by their instructor. 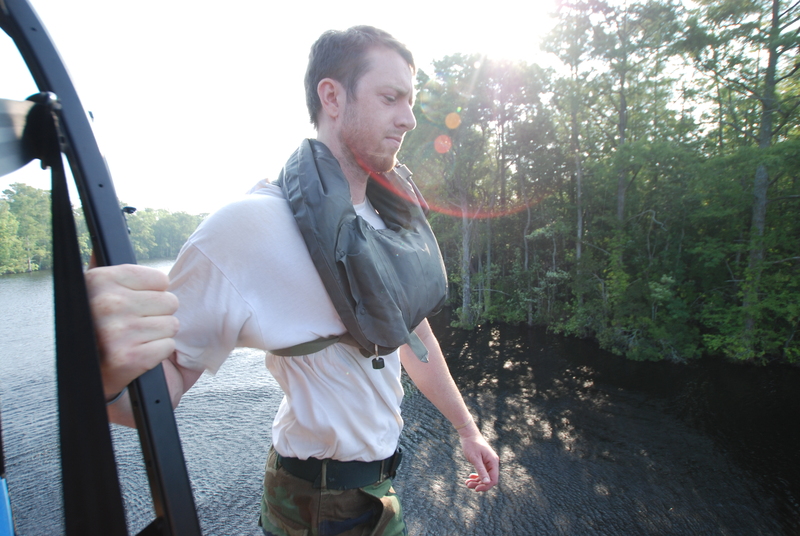 Our cameraman Ryan decided to get in some PT too, running with the team almost all the way, with video camera in hand. After a quick clean up, the men turned their attention to packing up their gear and supplies for the move back inland for the rest of training. I must say, it’s very impressive how quickly a huge house can be packed up and cleaned when 21 dedicated men all work together to achieve their goal. After the ride back to camp, they unloaded and enjoyed a short bit of rest time before beginning the afternoon’s activities. 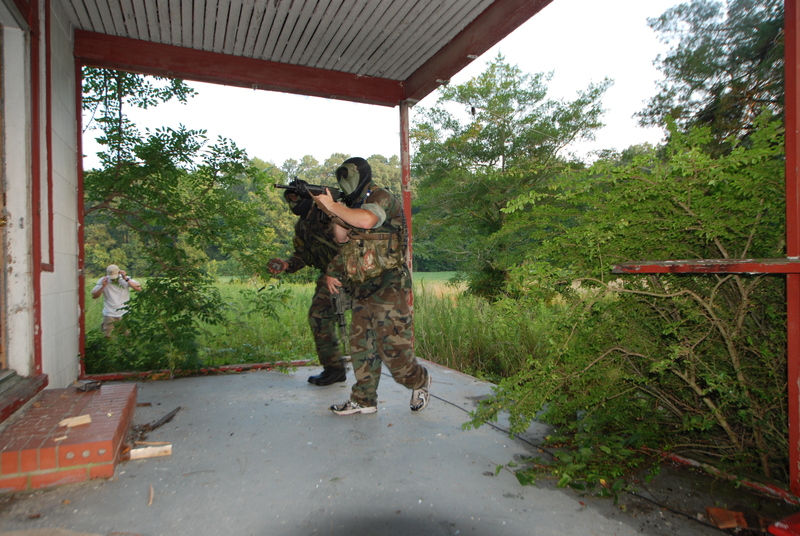 Training this afternoon consisted of close quarter combat (CQC) training with live air soft rounds. 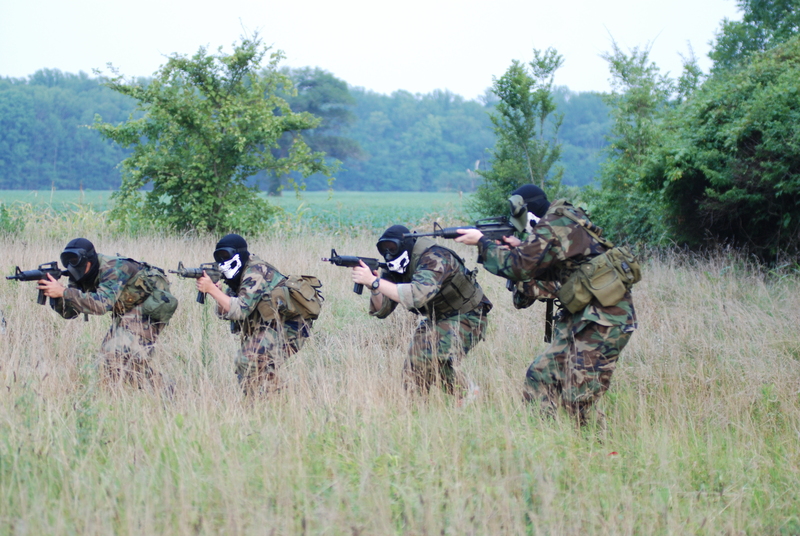 The men started by practicing formations in separate groups. 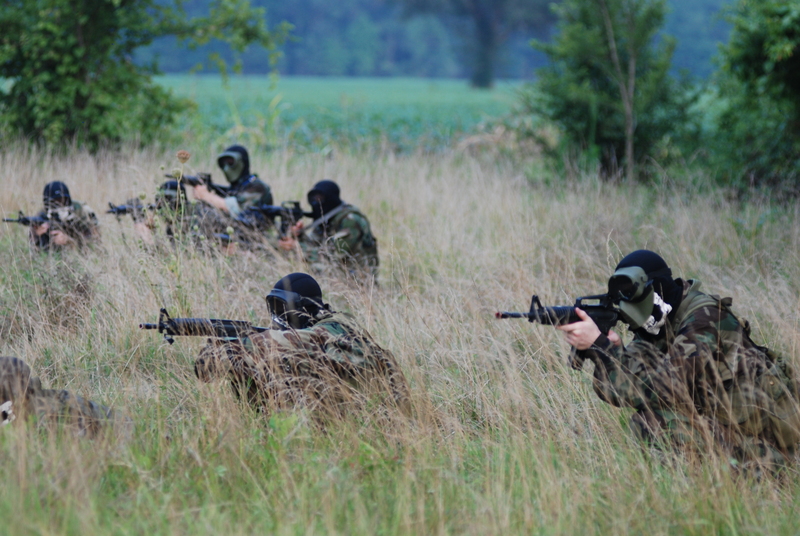 After gear issue, they proceeded to shoot each other with the air soft rifles from increasing distances to test both their accuracy and ability to take a shot during training. Once the men had completed these exercises, they were off to another local compound with abandoned buildings to practice seizing a compound and defeating the enemy. 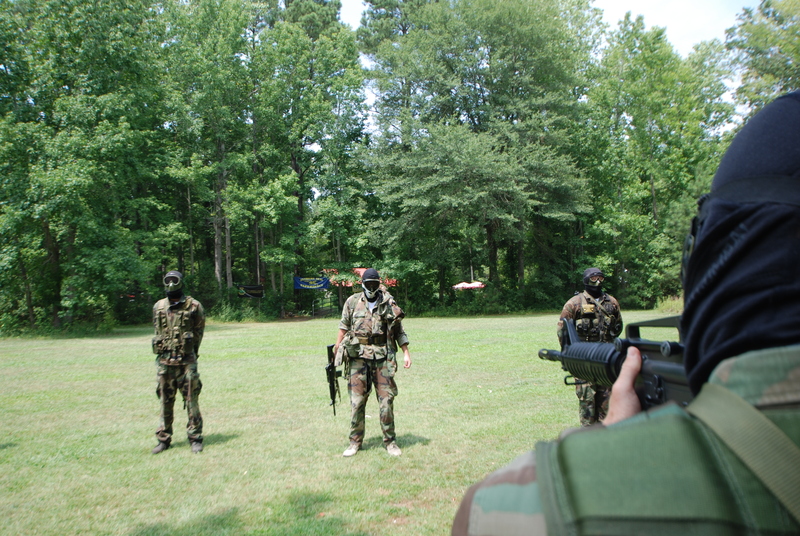 Splitting into groups, one playing the enemy defending home base and the other playing the SEAL team defeating home base, the men practiced formations and tactics they had just learned. 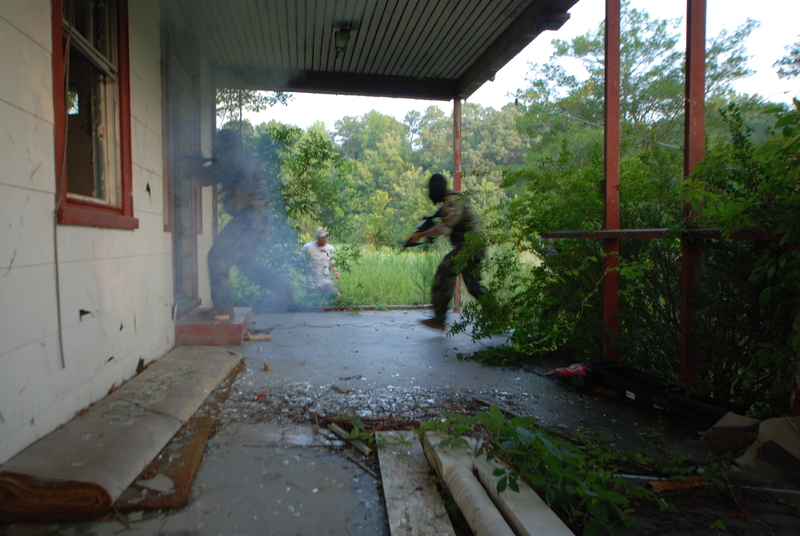 With one squad stationed in a series of buildings, the other would infiltrate the compound and work their way through the structures, clearing each one as they went. 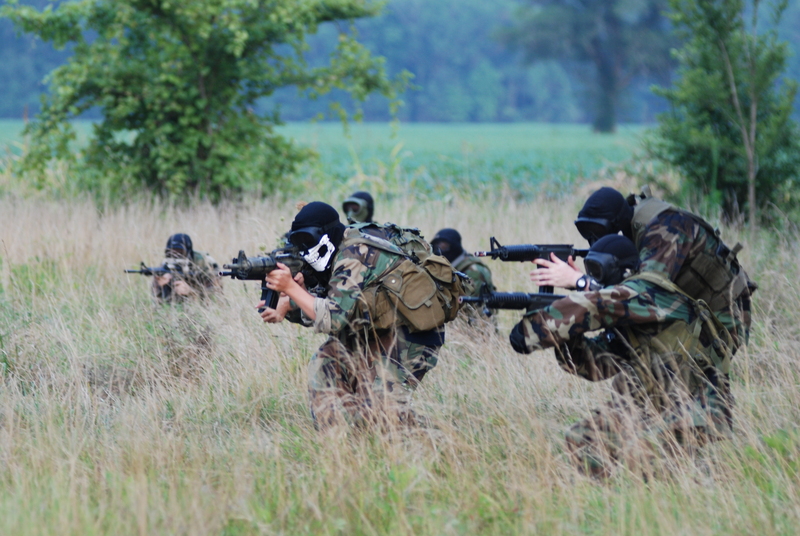 Leaders of the SEAL squad would split their group in two, commanding each smaller group though the specific movements and steps of approaching and taking down an enemy building with their stealth and weaponry. 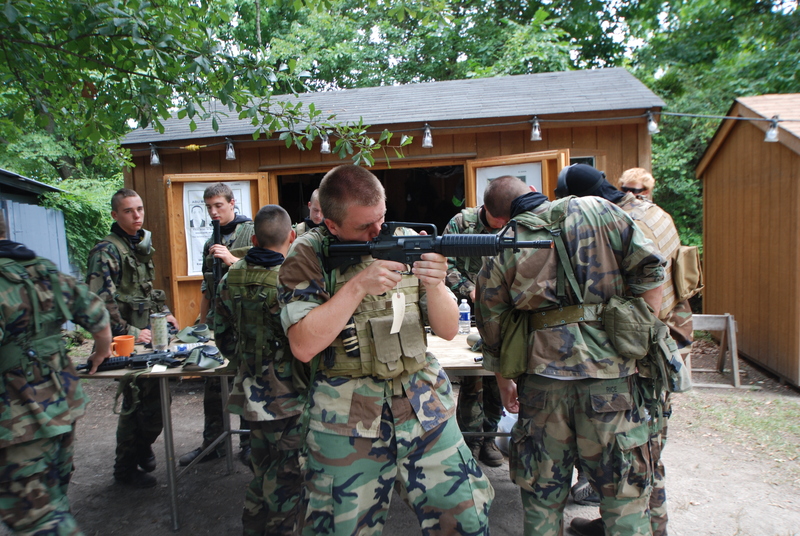 The squad playing the enemy would set up to defend their base and readily attack their opposition with their air soft weapons. Naturally, the SEALS always won. 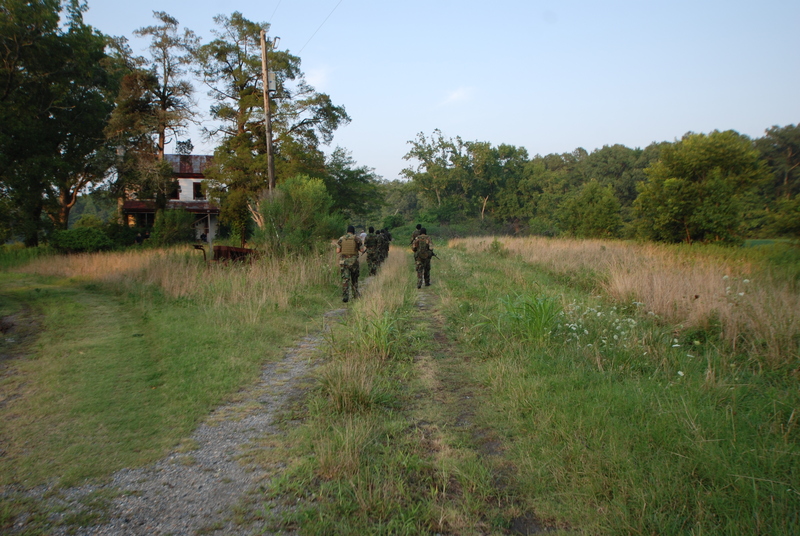 After several hours of training exercises within the abandoned compound, the team packed up their gear and headed back to camp for the night. 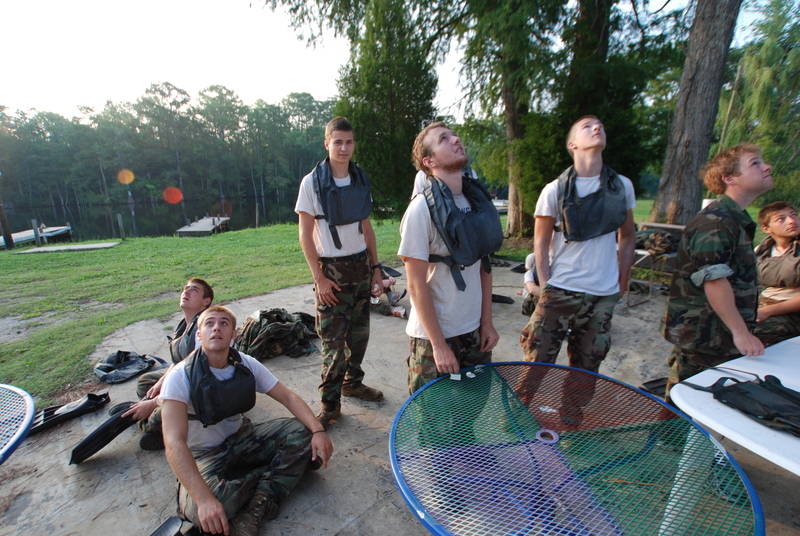 They’re going to need their rest, as tomorrow begins at 0700 with PT and quickly moves on to 0900 CQC training. We got to the SEAL house at 0800, ready to film the men have an early morning PT session, ending with a long run down the beach. 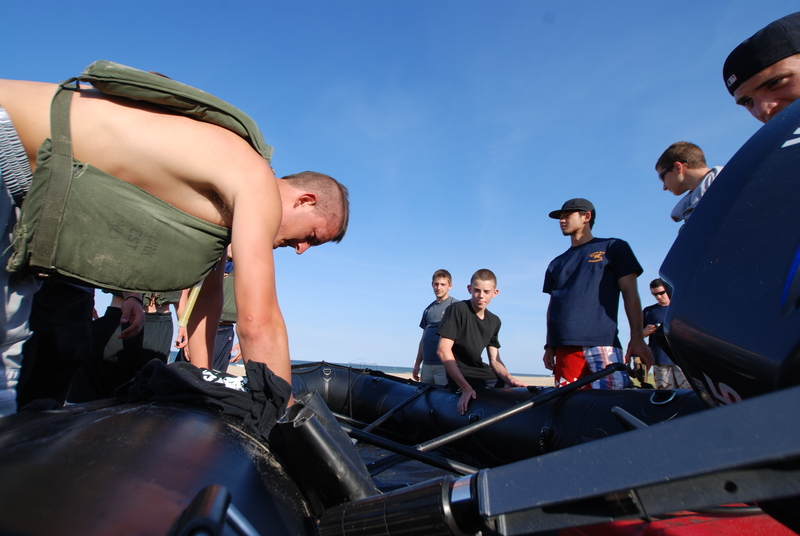 After their run, the men prepped their zodiac boats and mounted their engines. 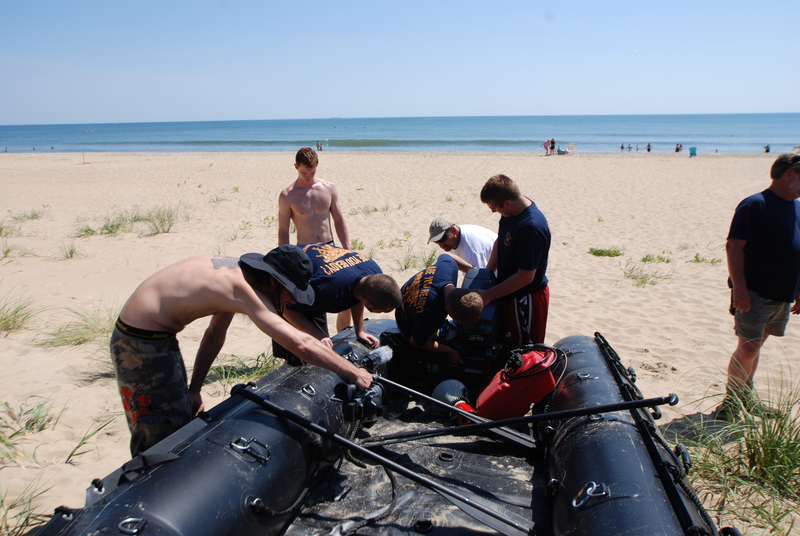 While one team practiced with the zodiac boat engines, breaking through the waves and beaching the boat again with the motor safely risen, the other team was sent on a long swim training session learning how to maneuver through the sea wearing the gear, boots and all. After the grueling PT and training sessions, it was rest time for the men and for us film crew. 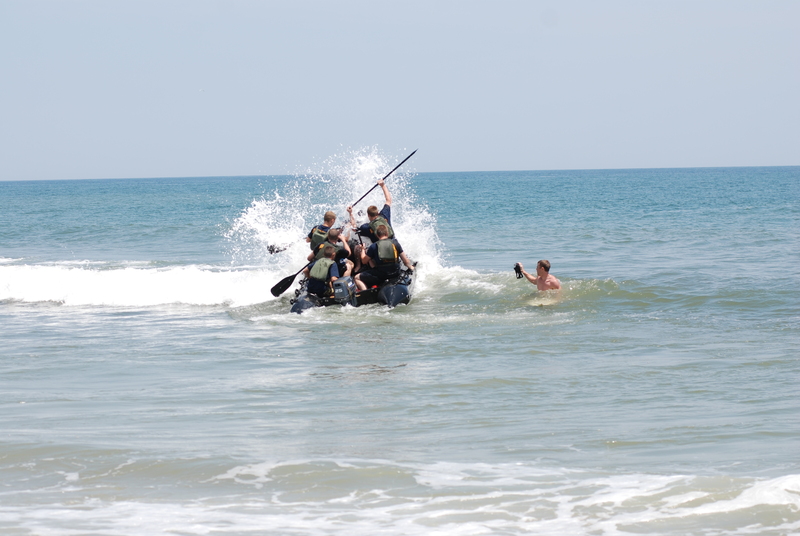 After a few hours’ break, the men readied their zodiac boats once again for a mission to storm the beach in front of a nearby restaurant, a well-deserved treat for the men. The students split into two groups- one rode the boats to the restaurant while the other half rode in the bus. Tonight’s meal was a great break and reward for all of their hard work. 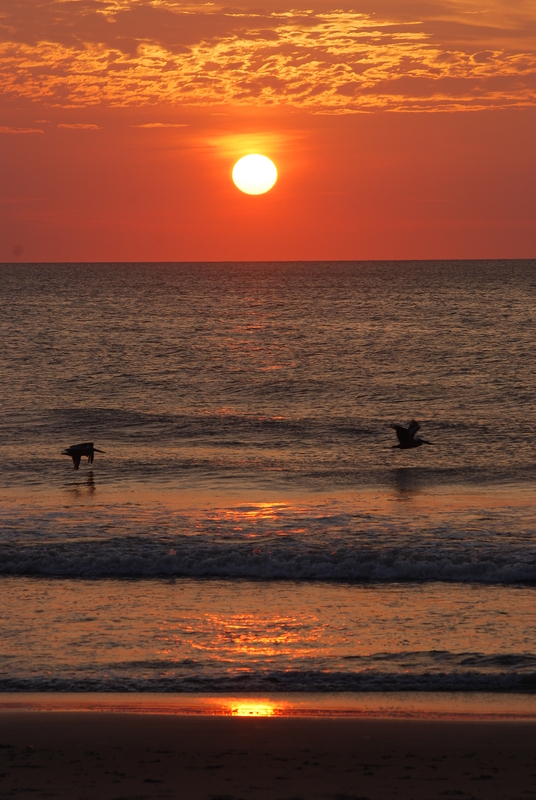 Tomorrow morning is an 0600 sunrise PT/run, looking forward to seeing the dolphins with the sun rising in the background.